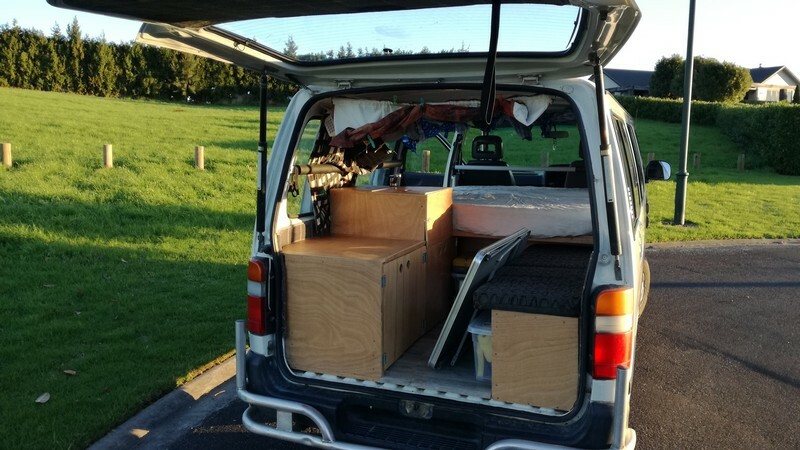 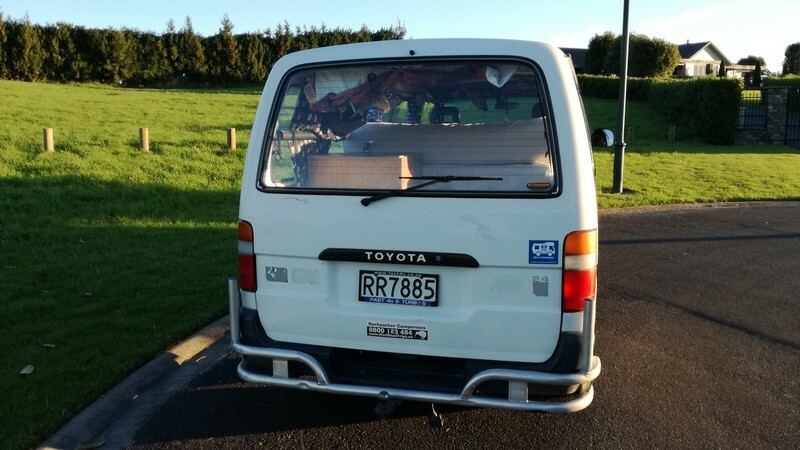 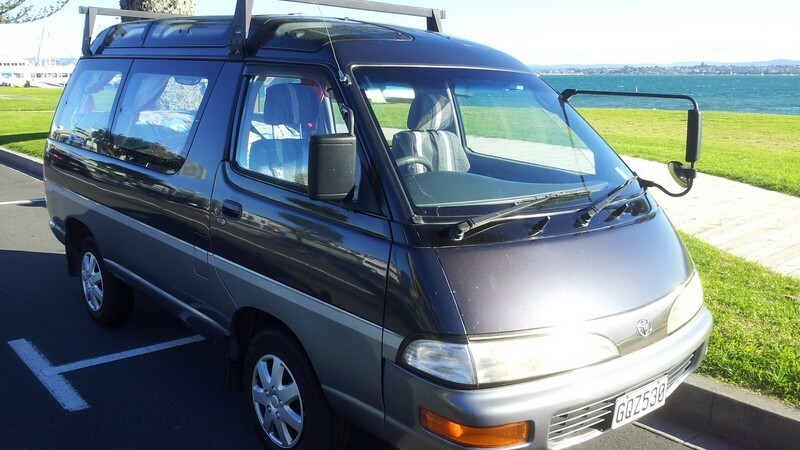 Here is a selection of New Zealand Campervans for sale with buy-back guarantees. 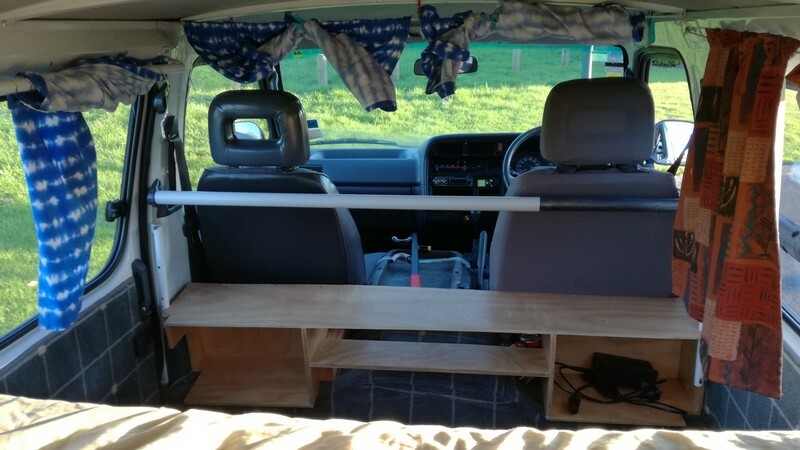 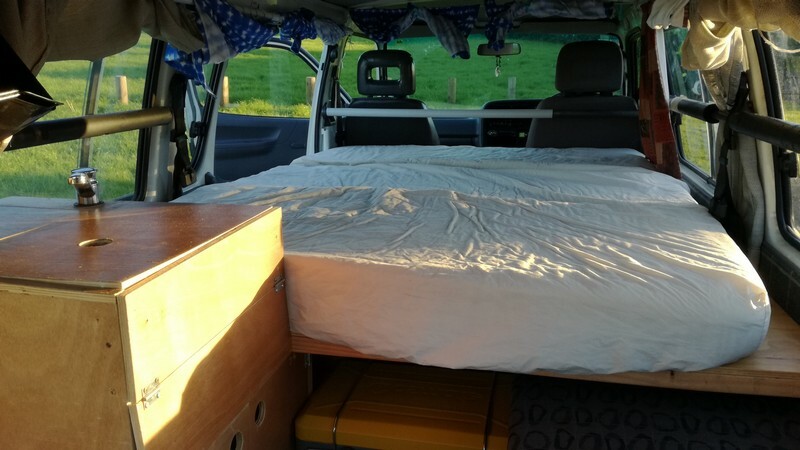 We can also build to order so if you have specific requirements for a campervan, or for camping gear, please tell us what you are looking for and we may be able to provide it for you. 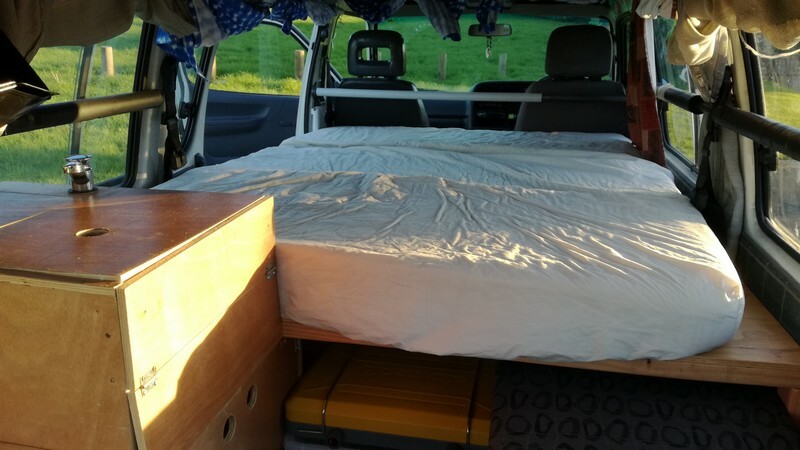 Please contact us to discuss your backpaker campervan requirements. 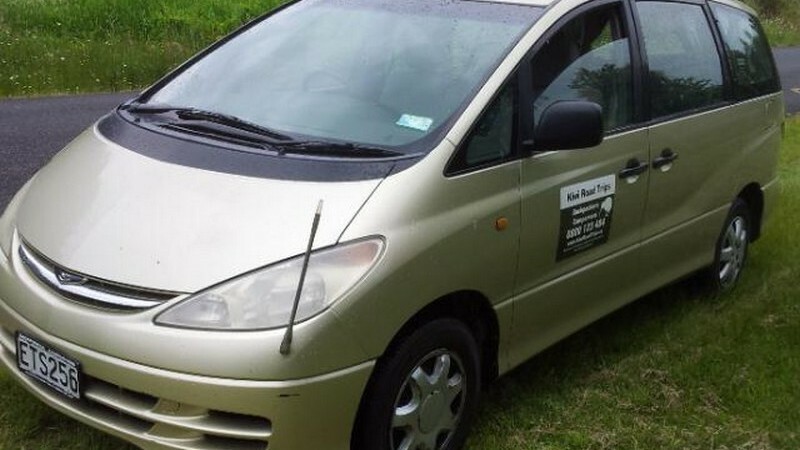 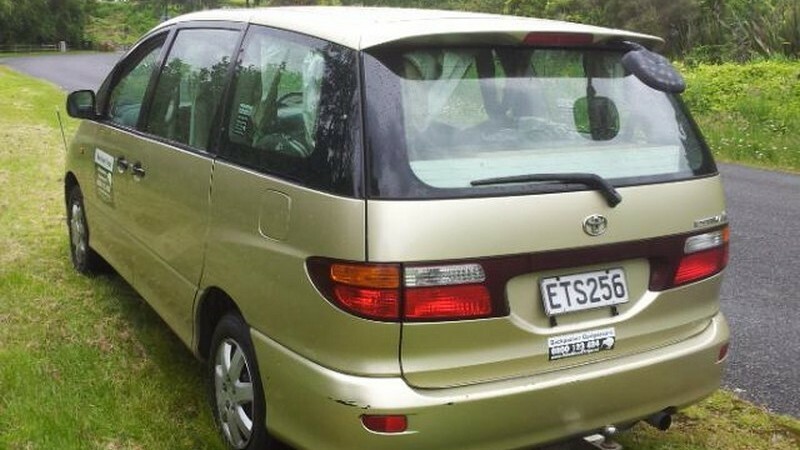 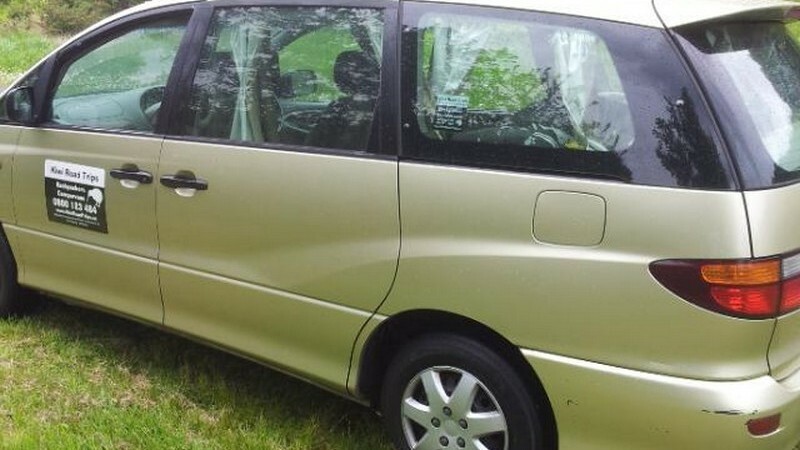 Toyota Estima Campervan, Gold, 2000. 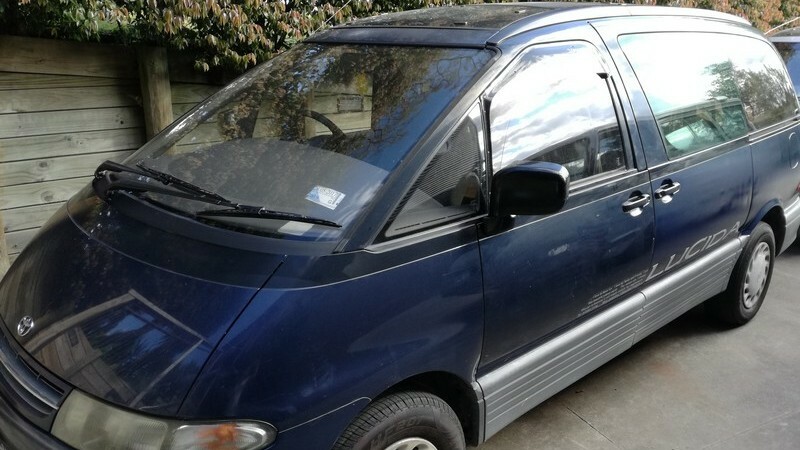 This is the modern looking 2-side-door model. 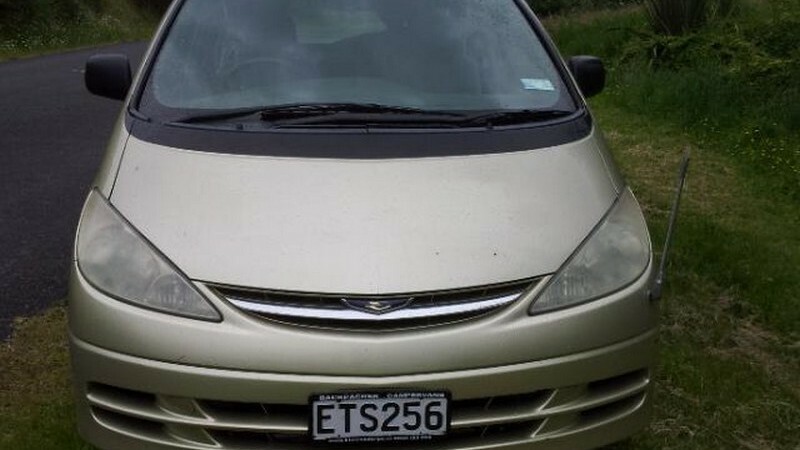 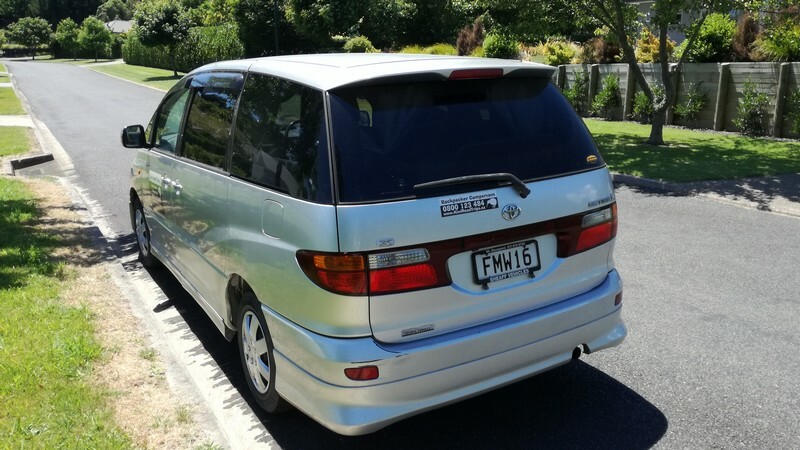 5-door, Petrol, 2438cc, Automatic is very nice to drive and in great condition for cruising around New Zealand. 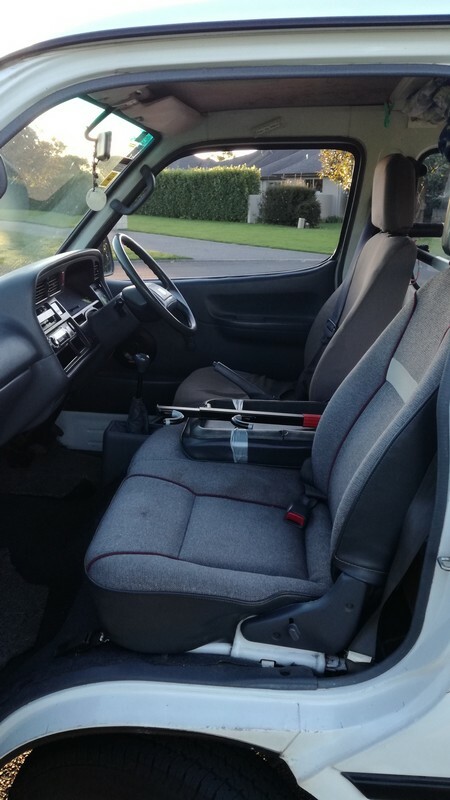 Chain driven no cambelt to worry about. 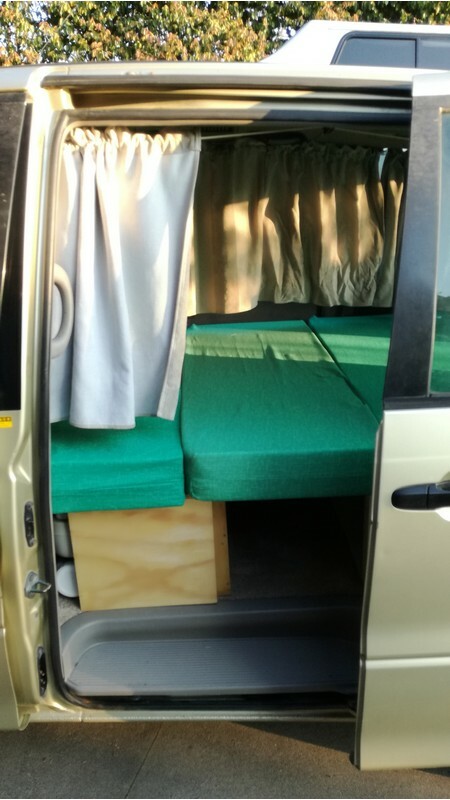 It has a comfortable double bed (1.9m x 1.35m wide) which can be folded back to allow seating inside the van. 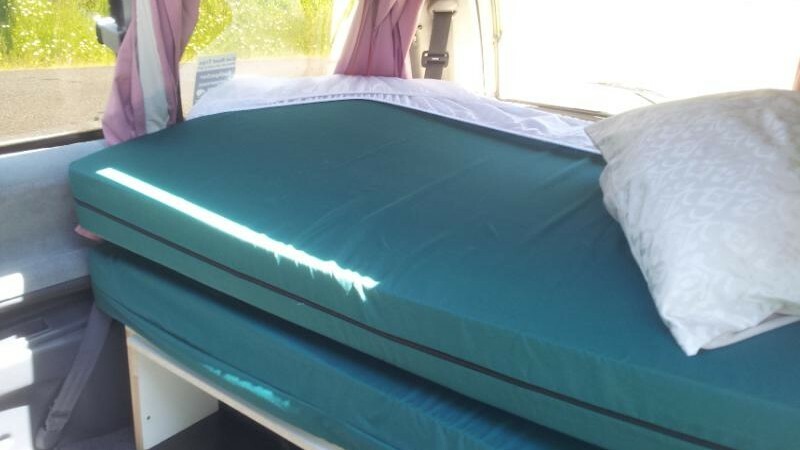 It comes with a foam mattress, duvet and duvet cover, two pillows and pillow covers. 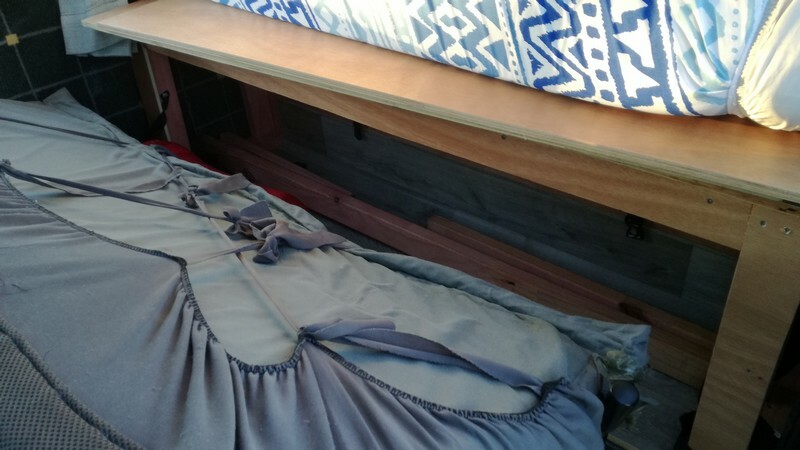 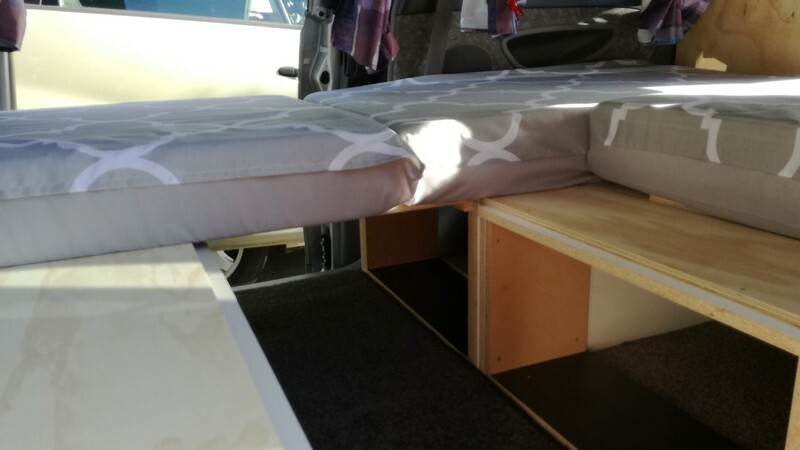 The van has good carpet, car seat covers, and camping equipment included such as two chairs, table, plates, cutlery, cooker stove, tea towels and two large storage bins that stow under the bed frame. 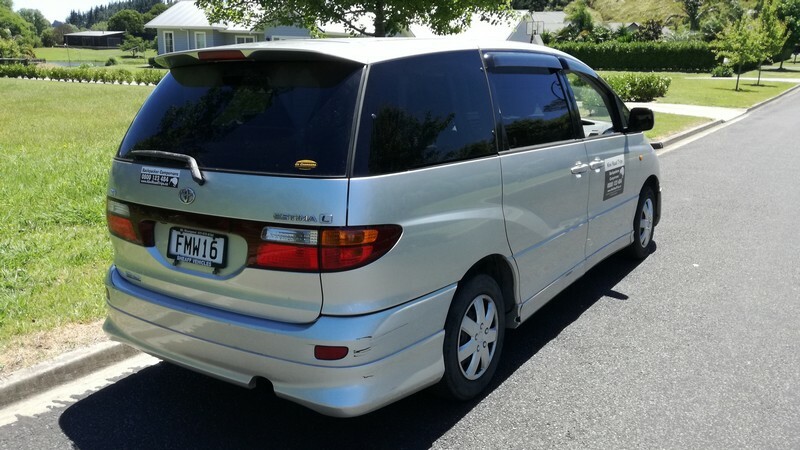 Toyota Estima Campervan, Silver, 2000. 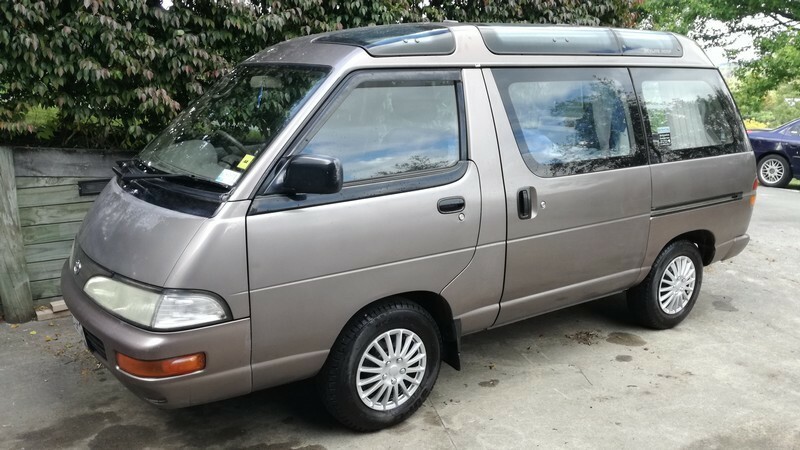 This is modern looking 2-side-door model is very nice to drive and in great condition for cruising around New Zealand. 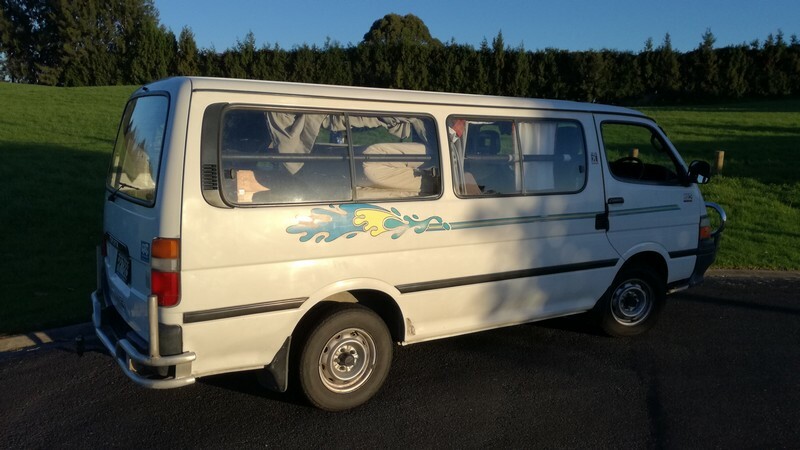 Chain driven no cambelt to worry about. 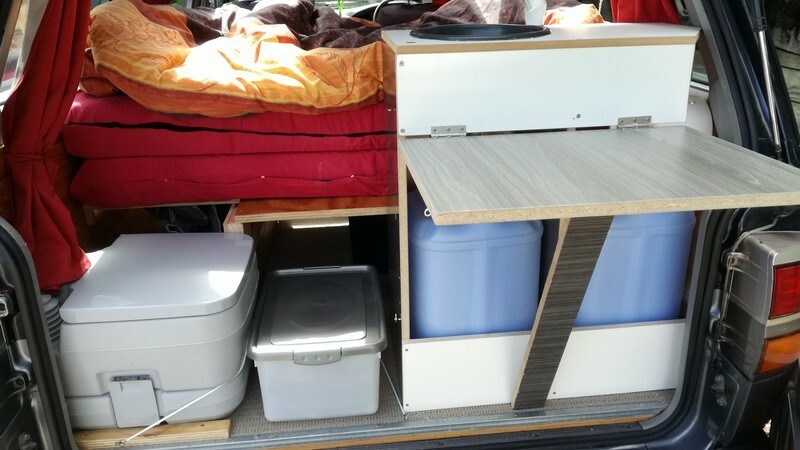 It has our latest layout design with a half-side kitchen shelving unit for food and cooking utensil storage, along with a table then opens out which is useful when preparing food. 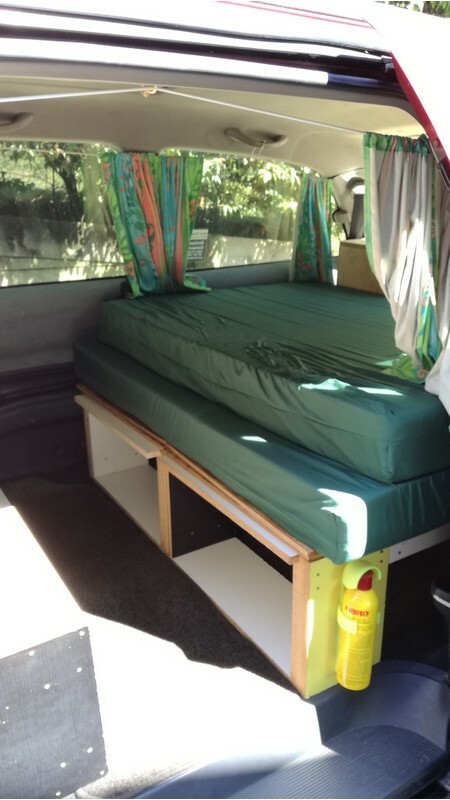 It has a comfortable double bed (1.9m x 1.35m wide) which can be folded back to allow seating inside the van. 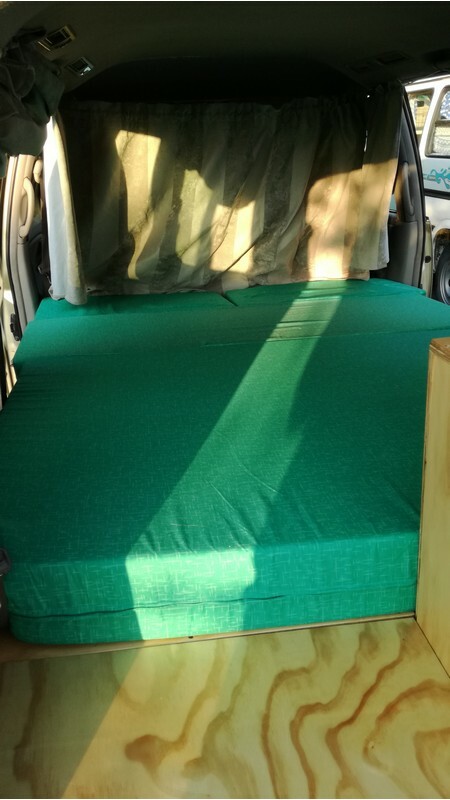 It comes with a foam mattress, duvet and duvet cover, two pillows and pillow covers. 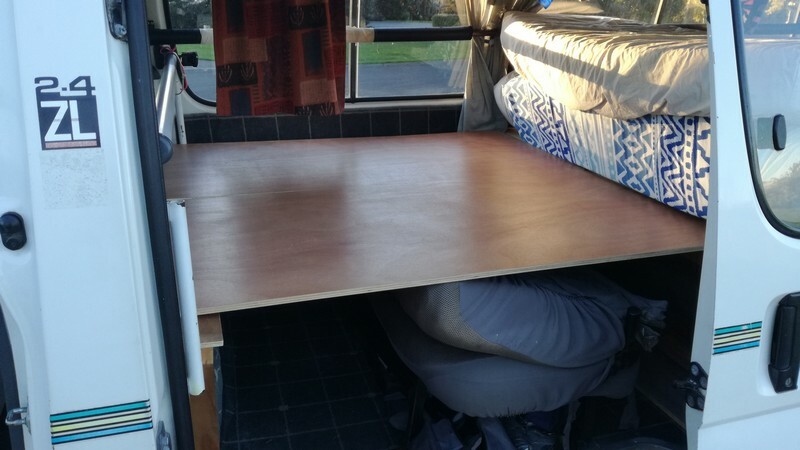 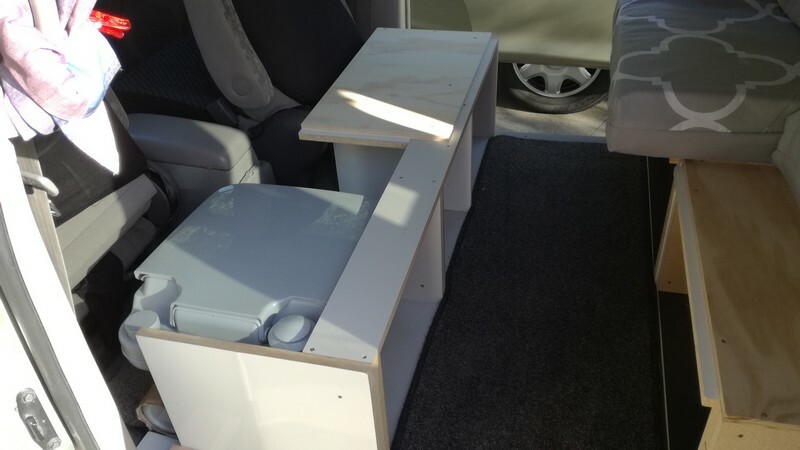 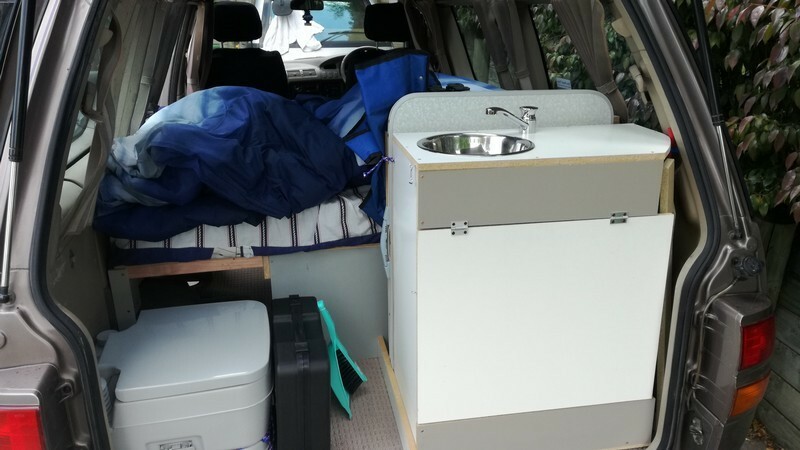 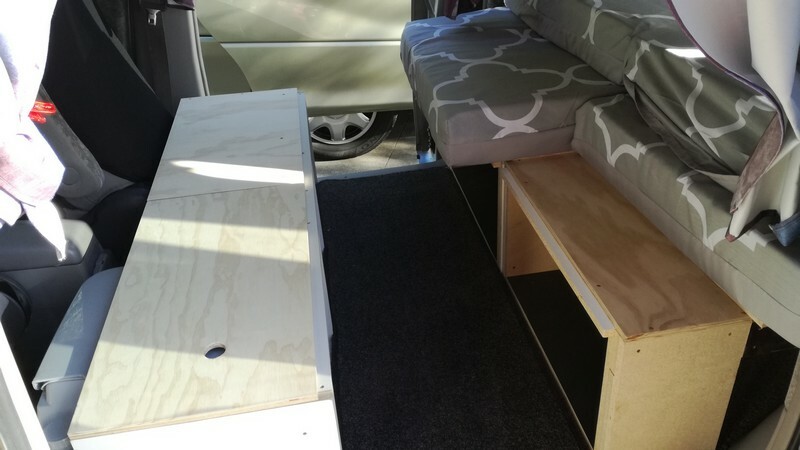 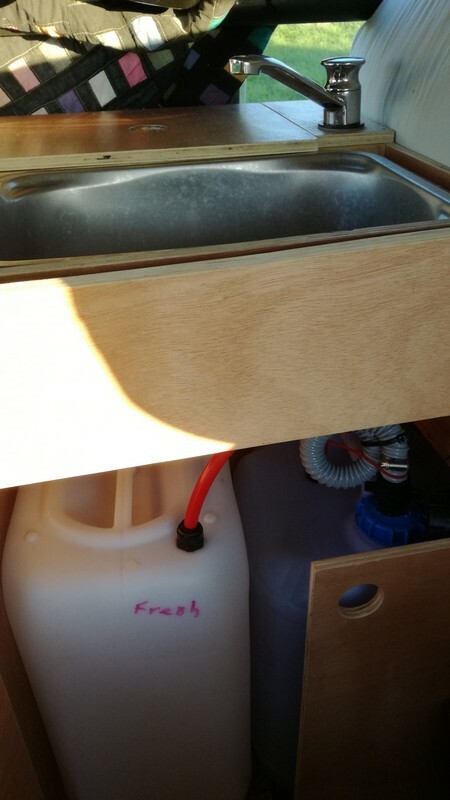 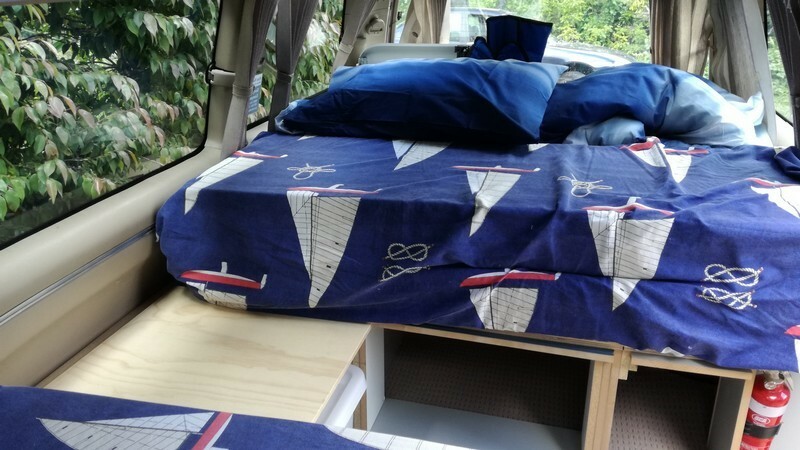 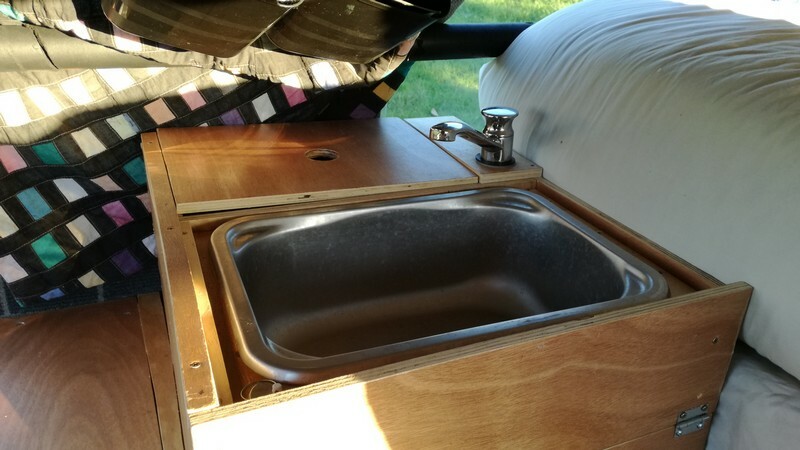 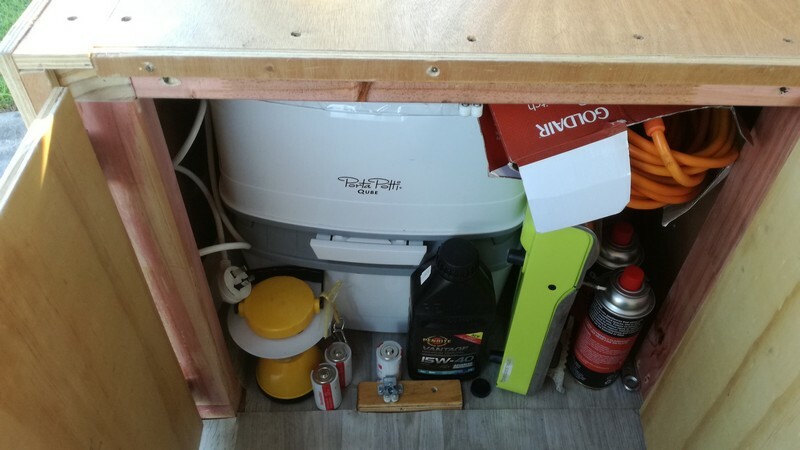 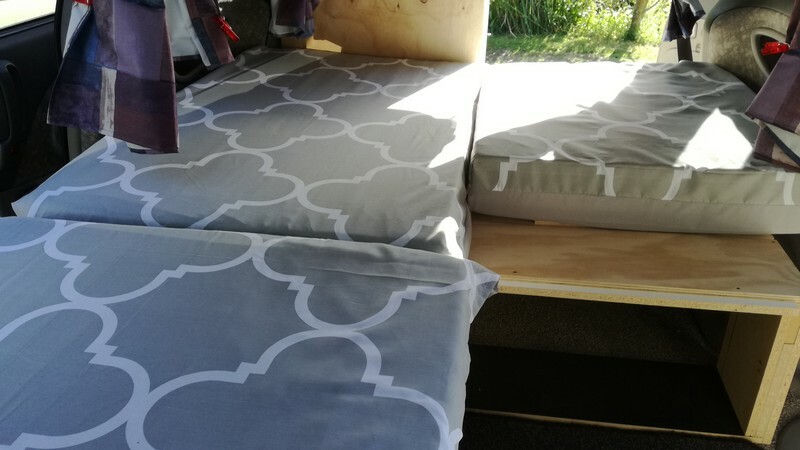 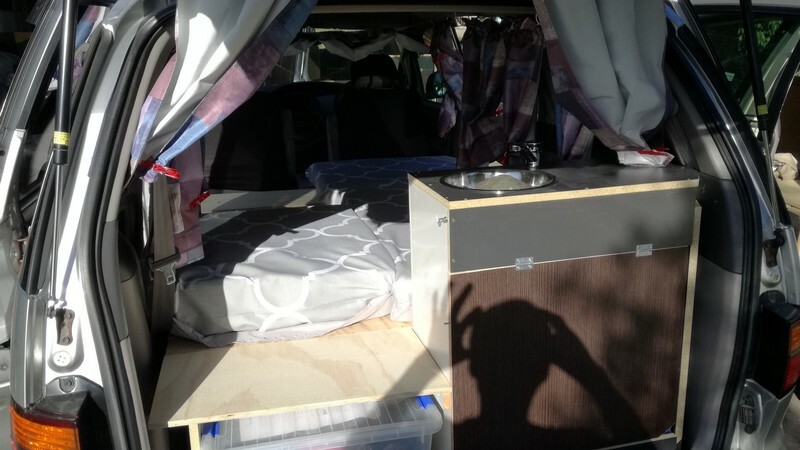 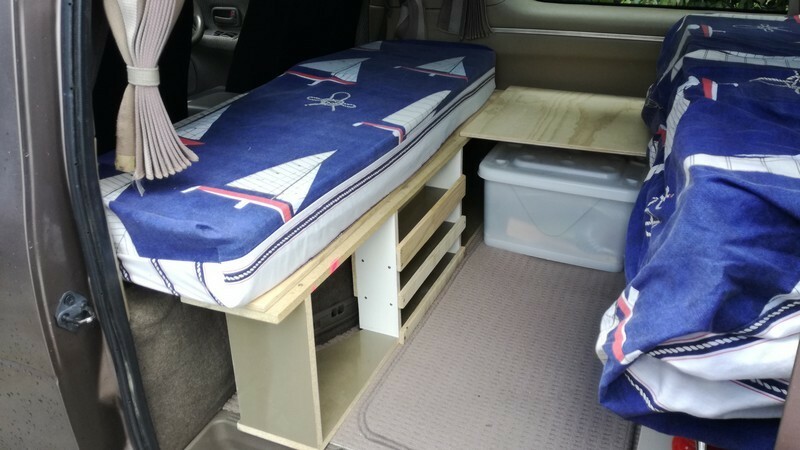 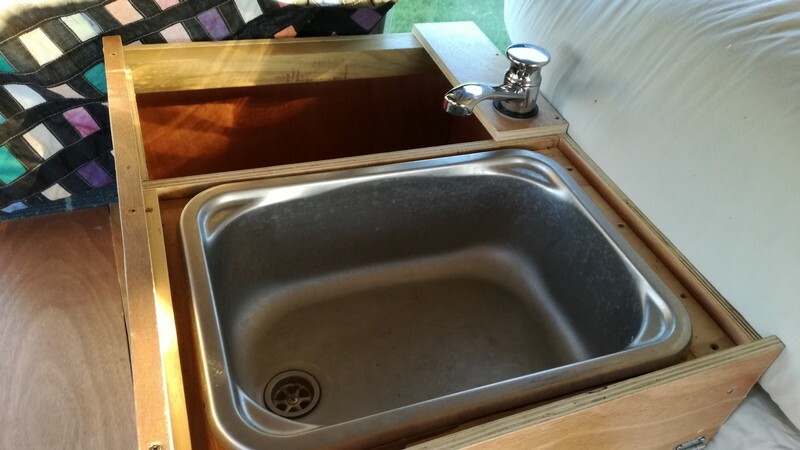 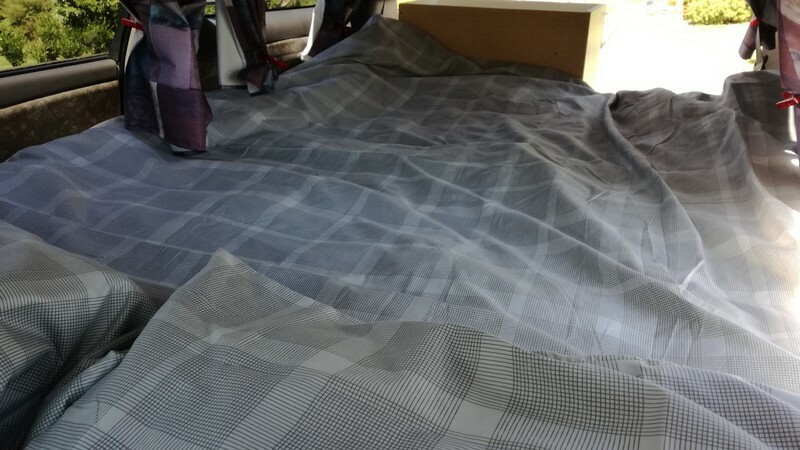 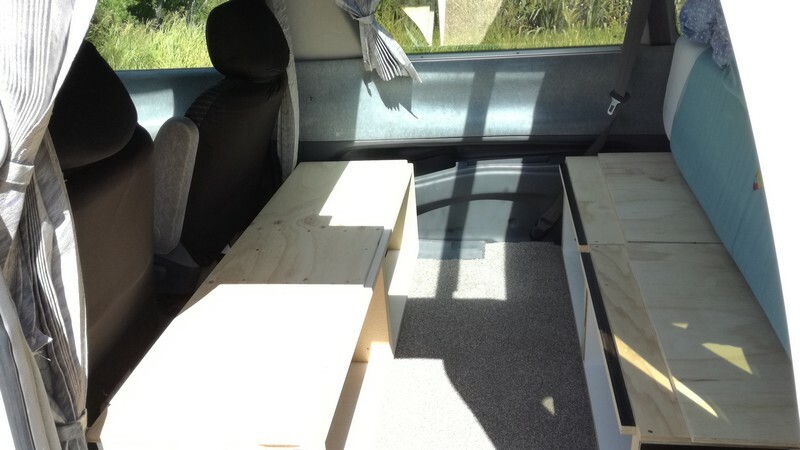 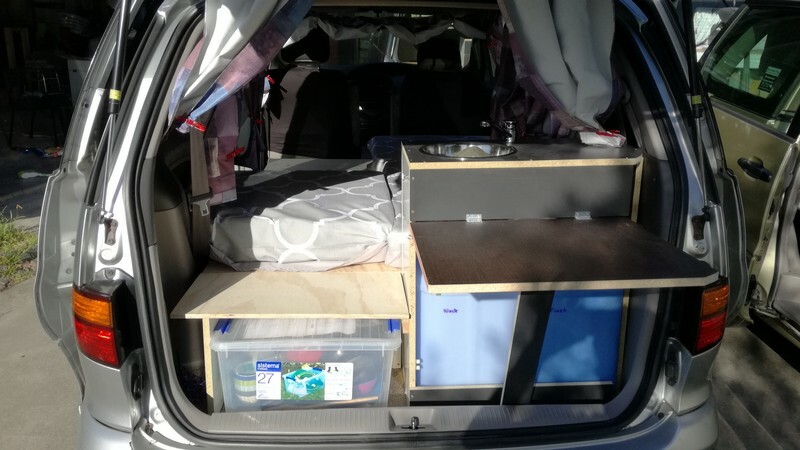 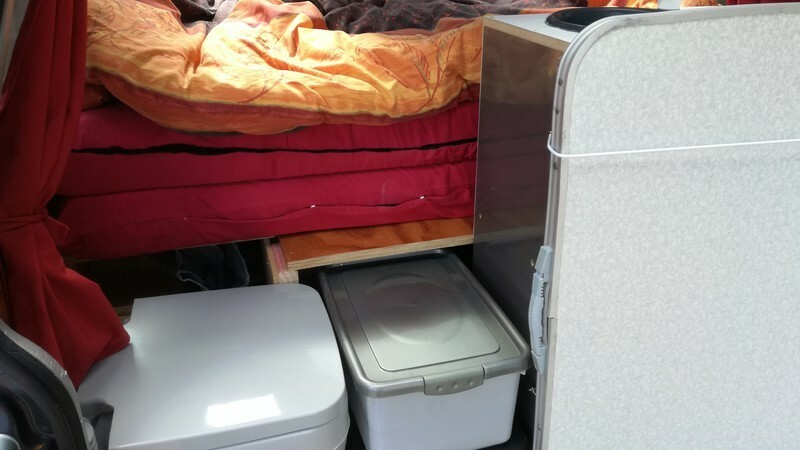 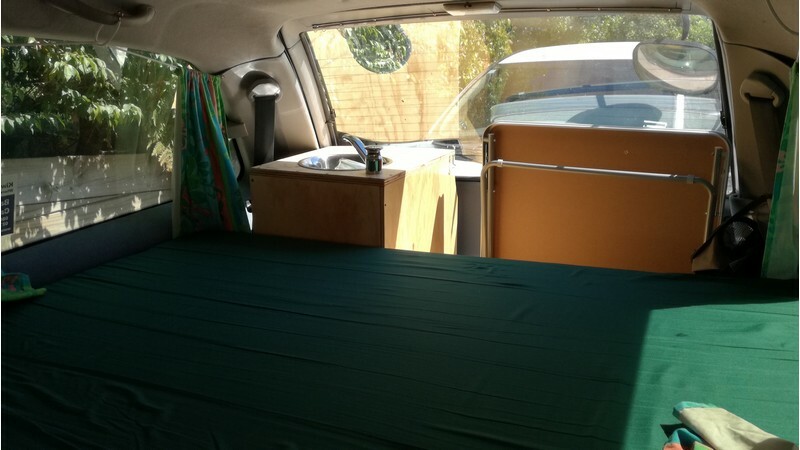 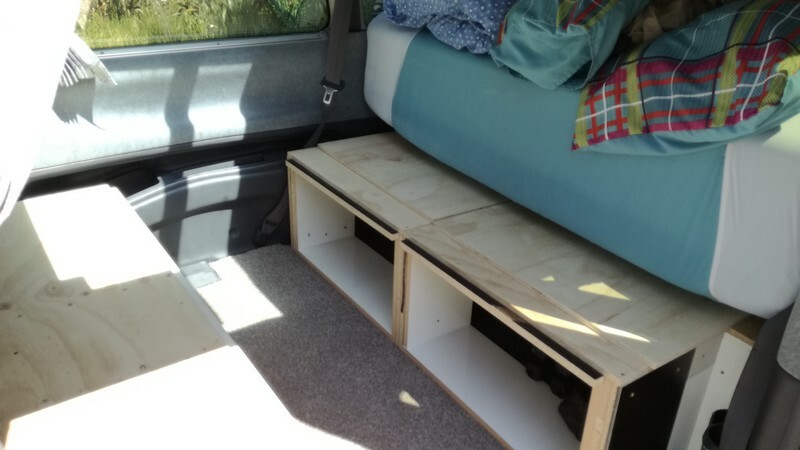 The van has new carpet, car seat covers, and camping equipment included such as two chairs, table, plates, cutlery, cooker stove, tea towels and storage bins that can stow under the bed frame or to the side of the kitchen unit. 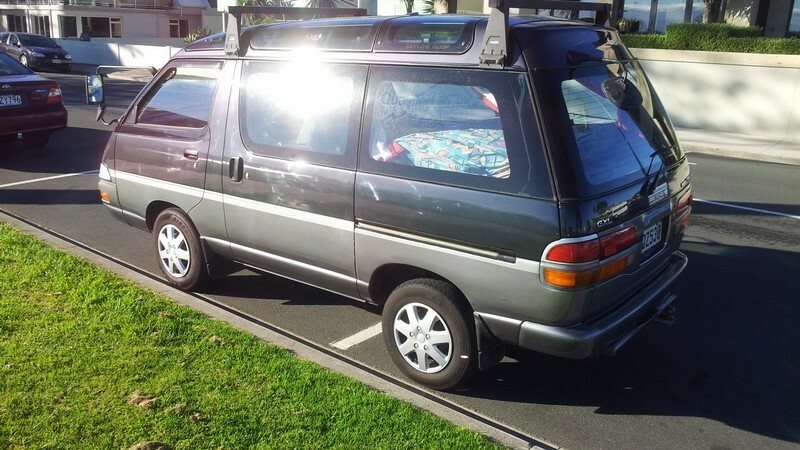 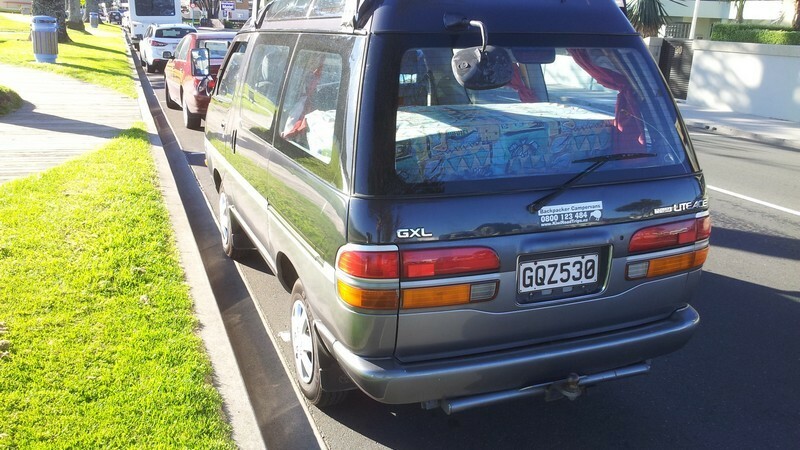 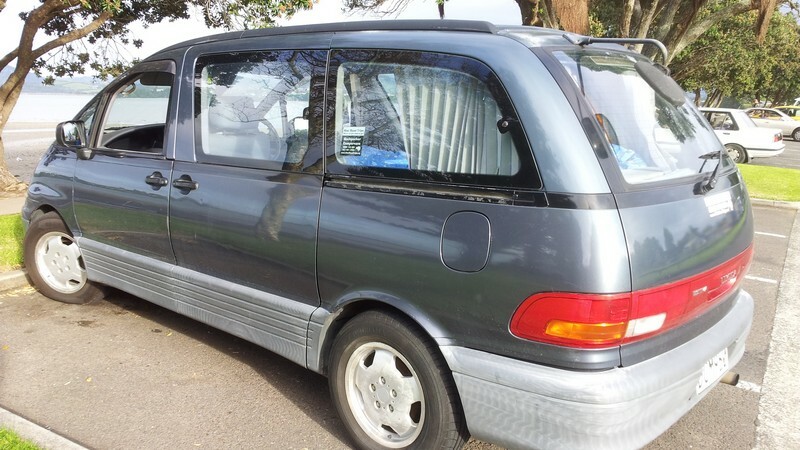 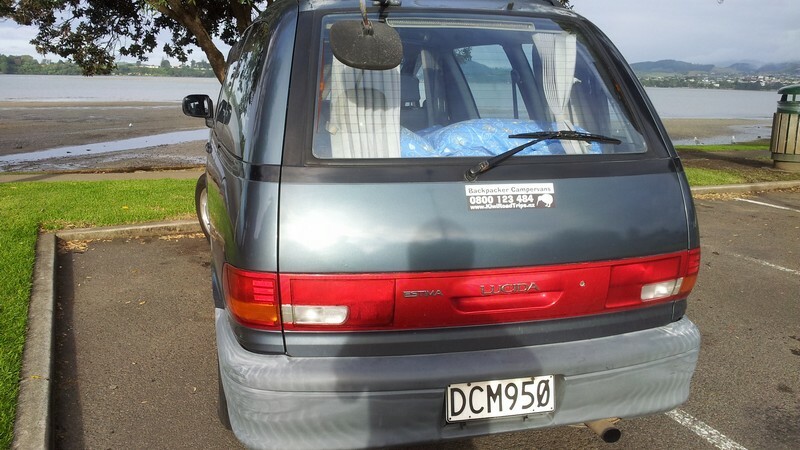 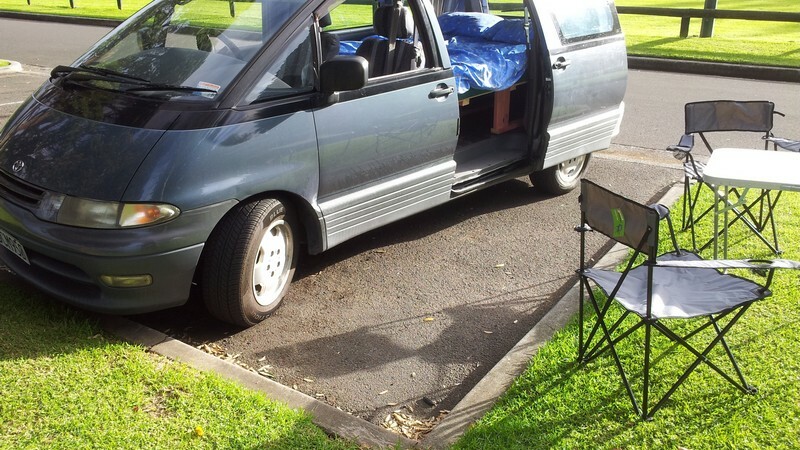 Toyota Liteace Campervan, Grey, 4 door van, Petrol, 1998cc, Manual, 313,000 km, 1992, with valid Rego and valid WOF. 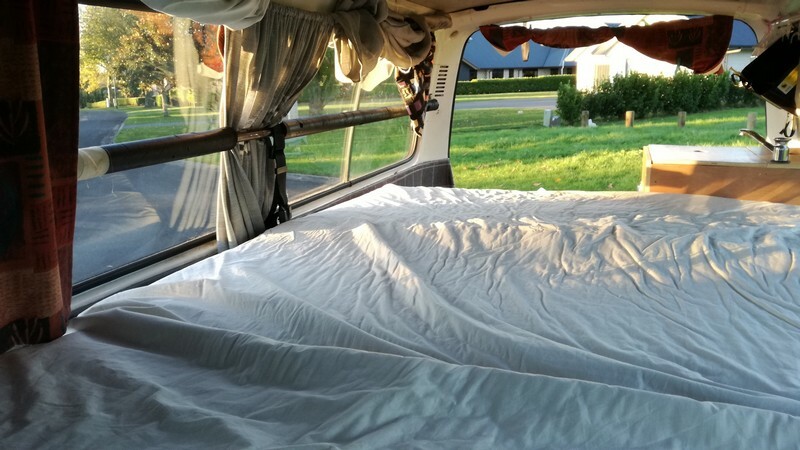 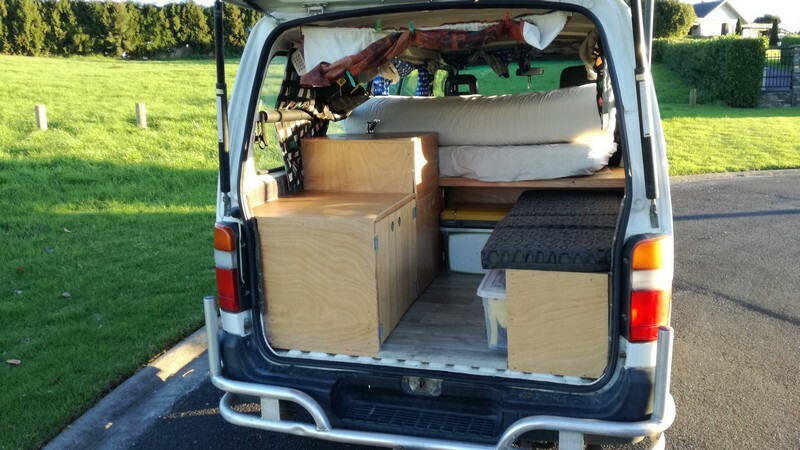 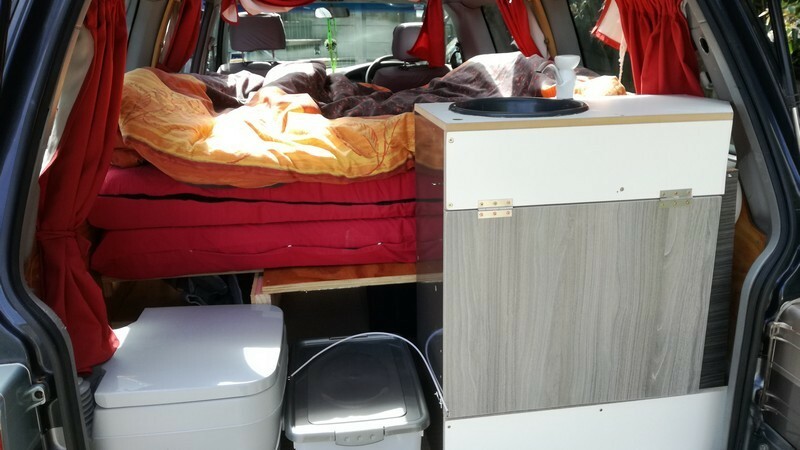 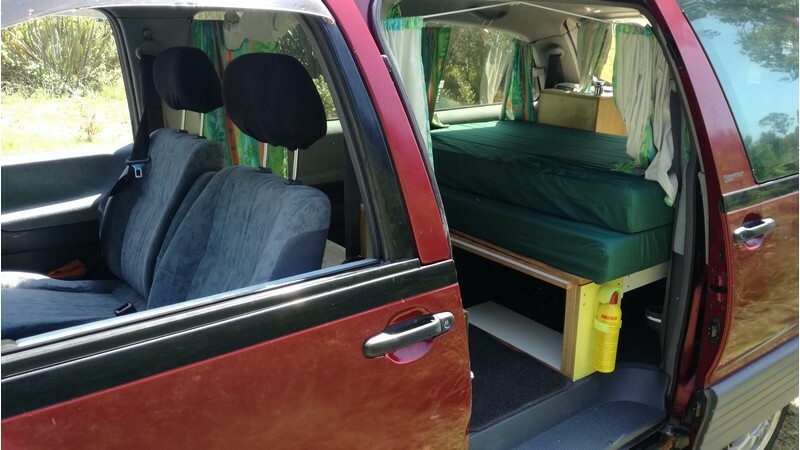 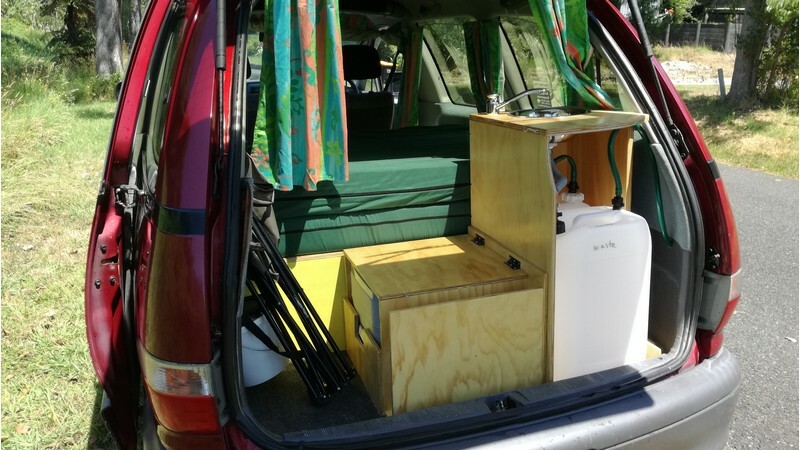 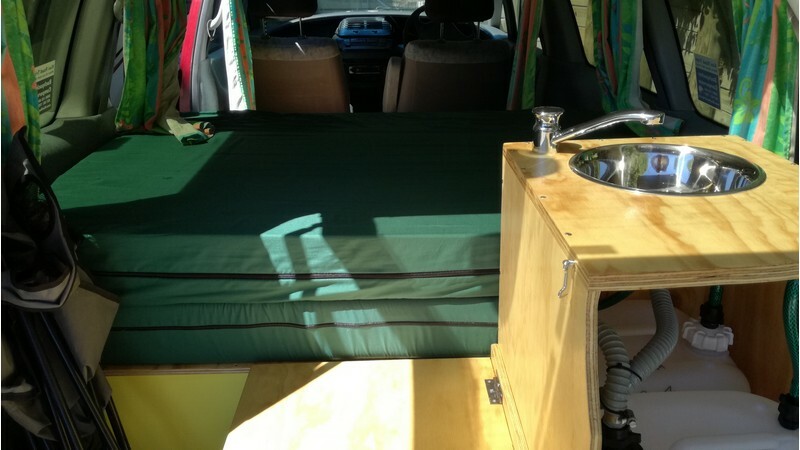 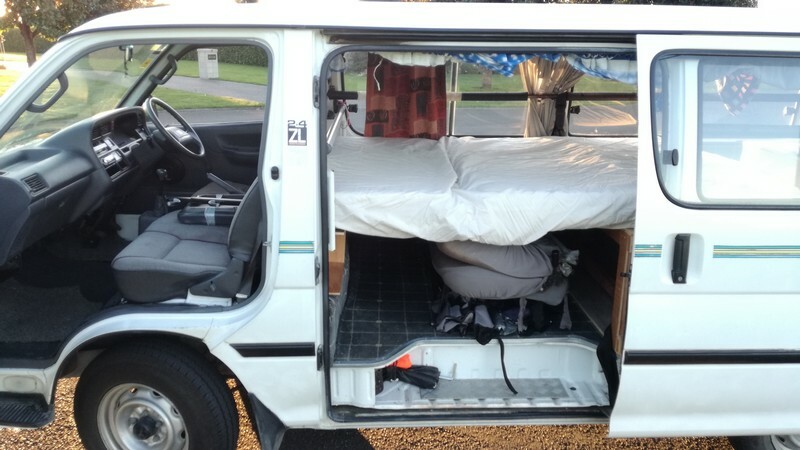 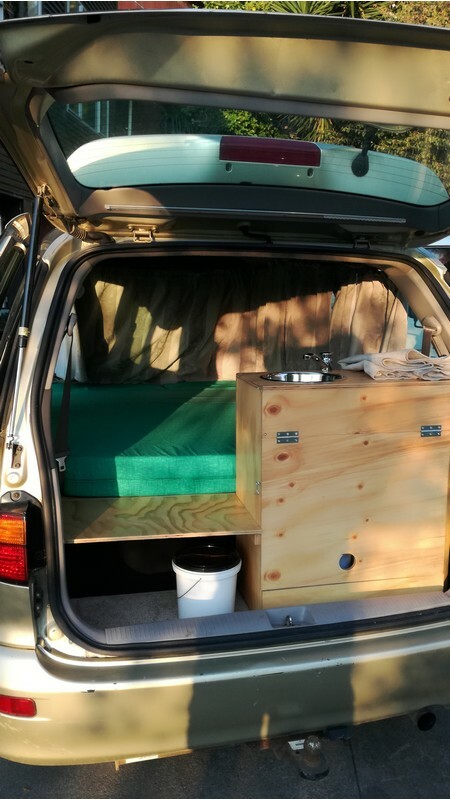 This is a Toyota Liteace converted to a self-contained-certified campervan and idea for backpackers. 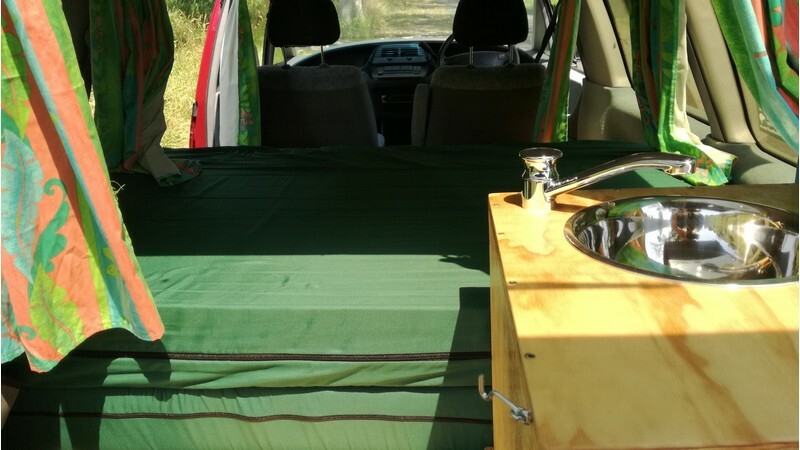 It has a roof rack and storage suitable for surfboards and fishing gear so it’s brilliant for outdoor adventures. 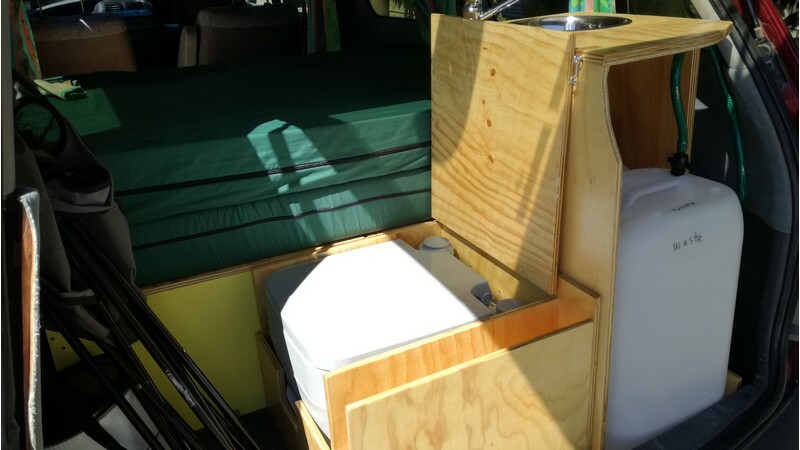 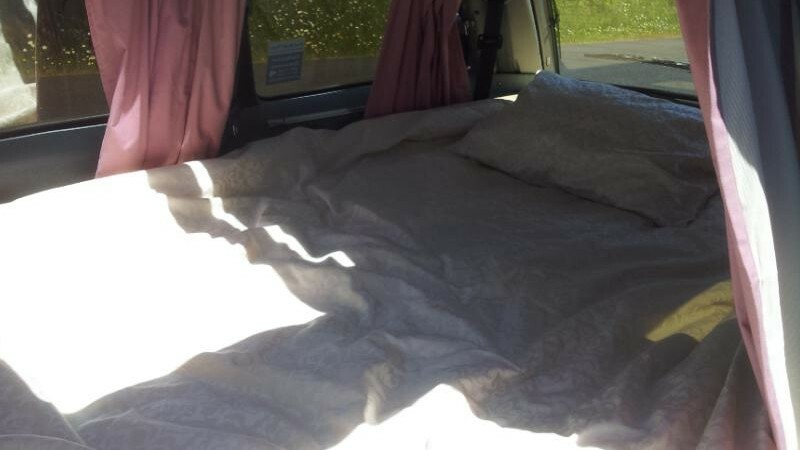 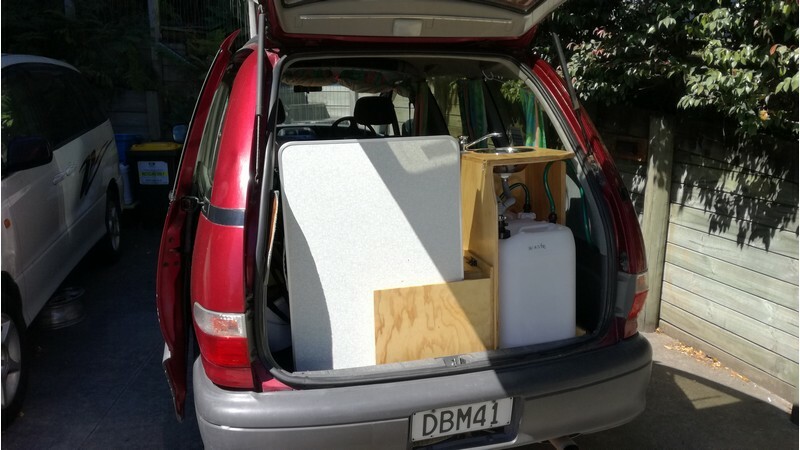 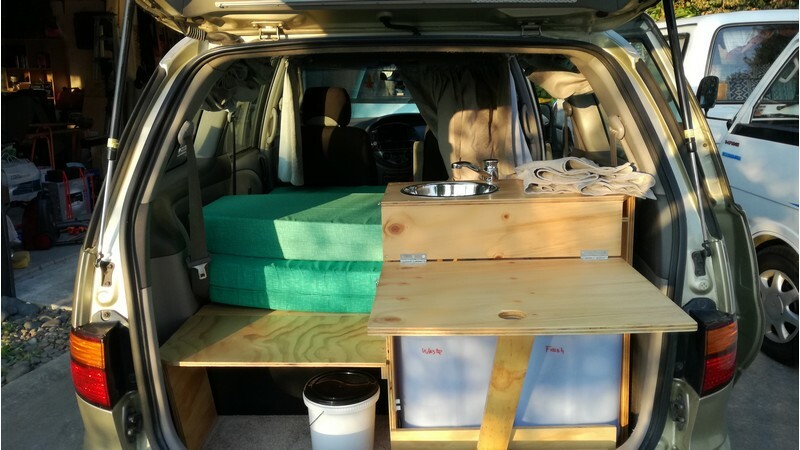 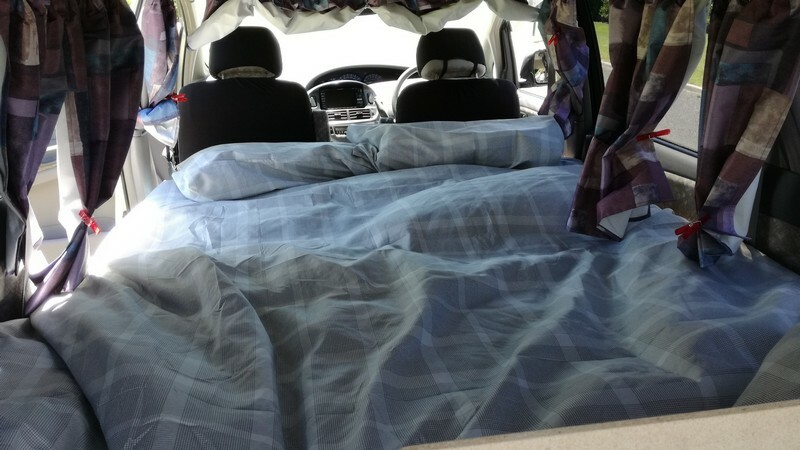 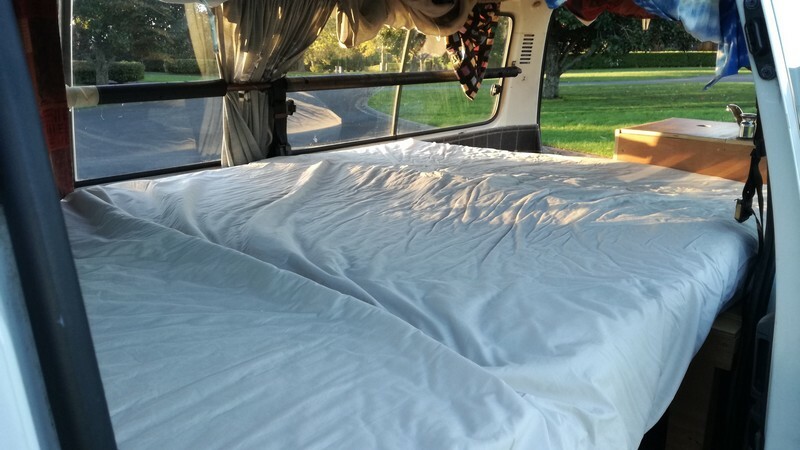 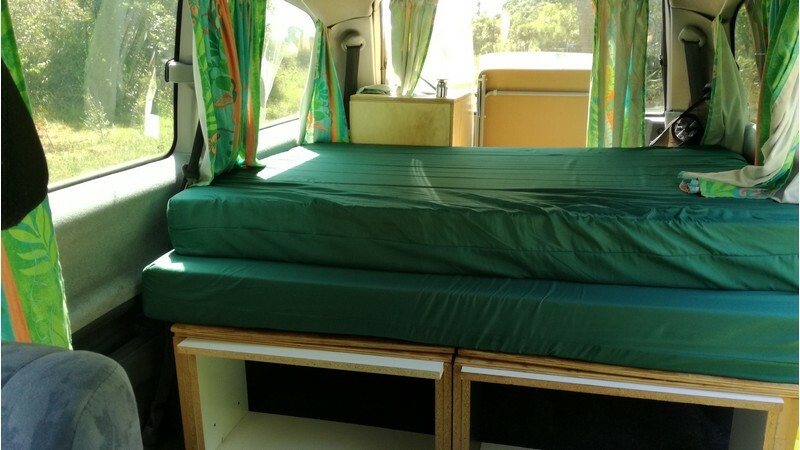 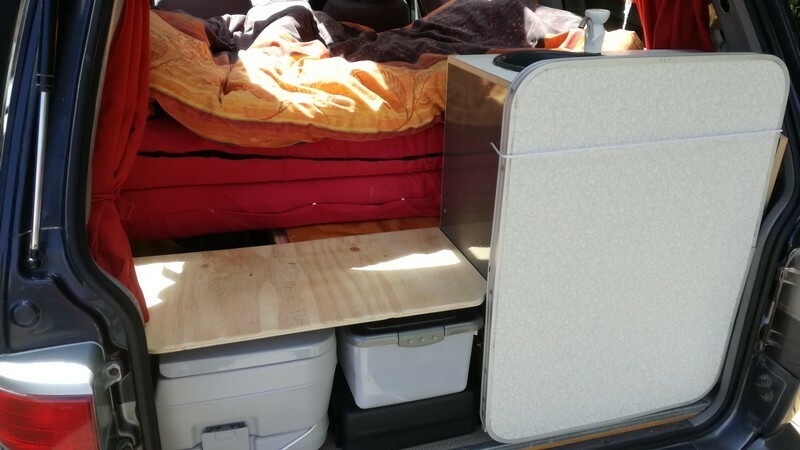 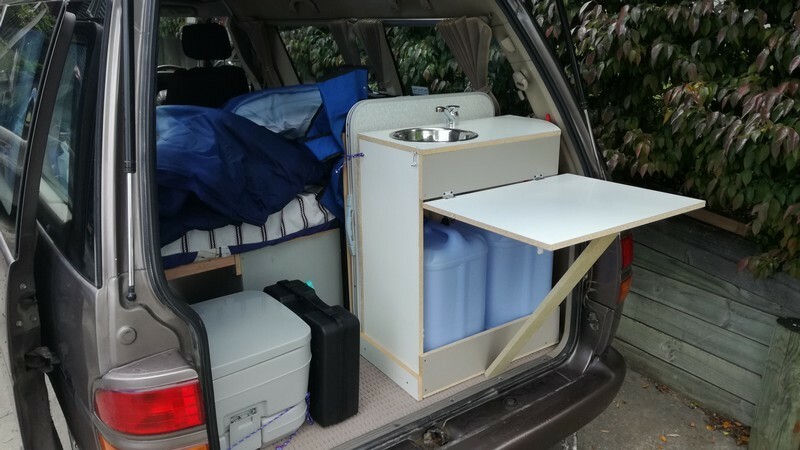 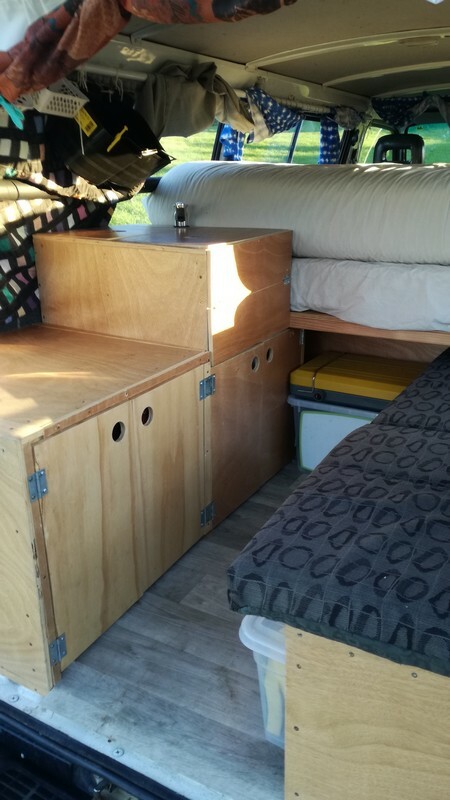 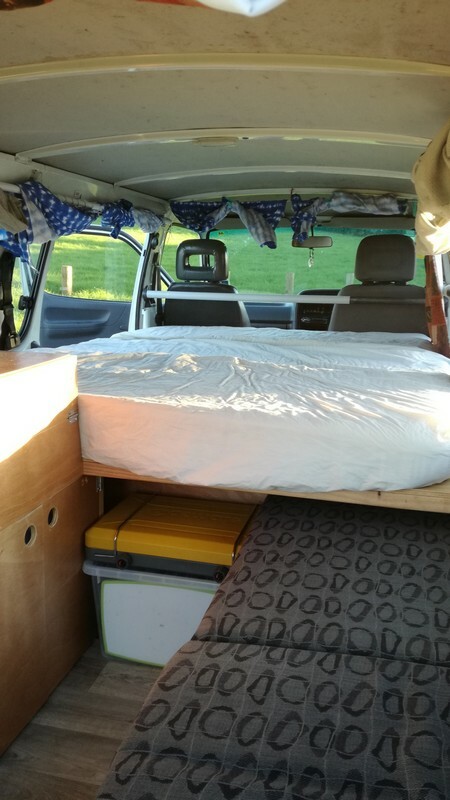 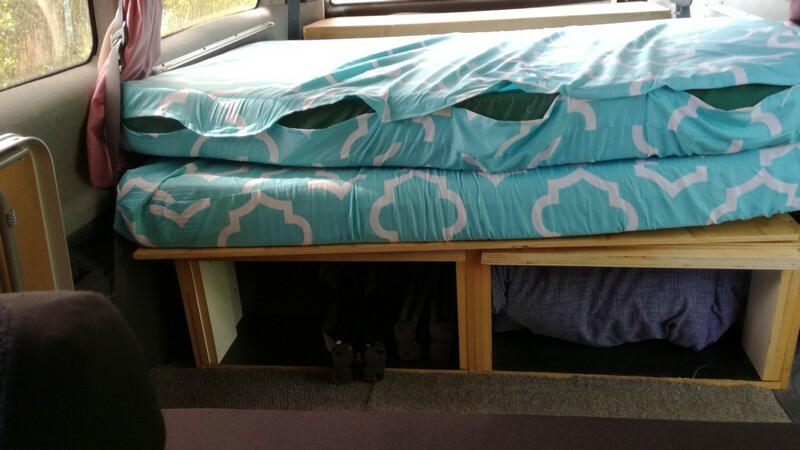 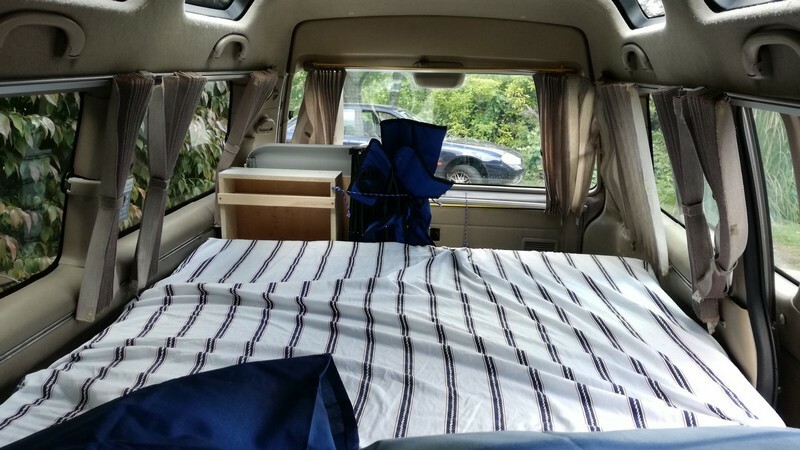 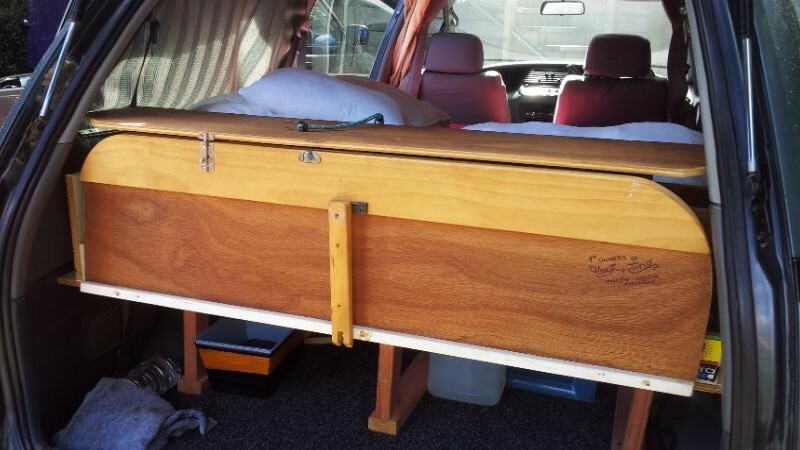 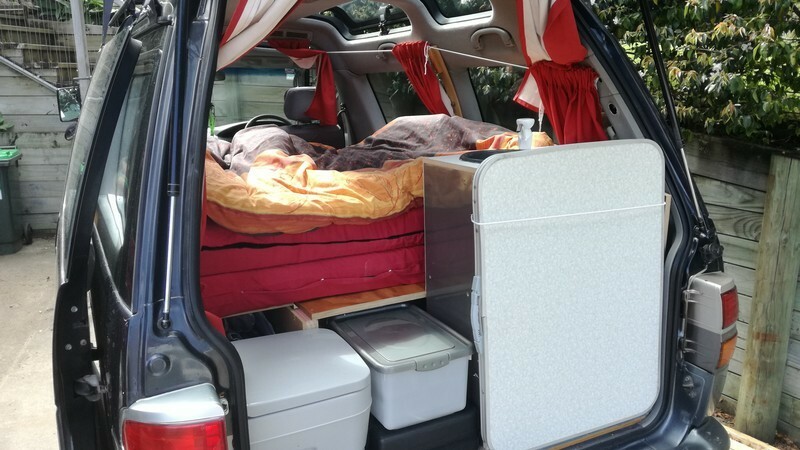 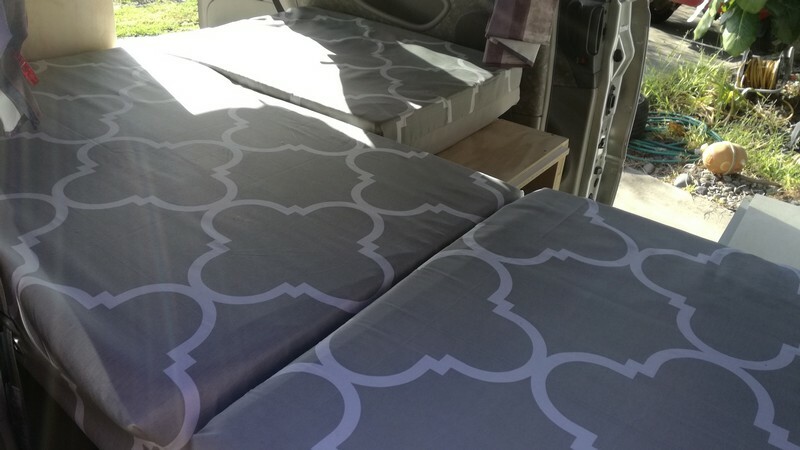 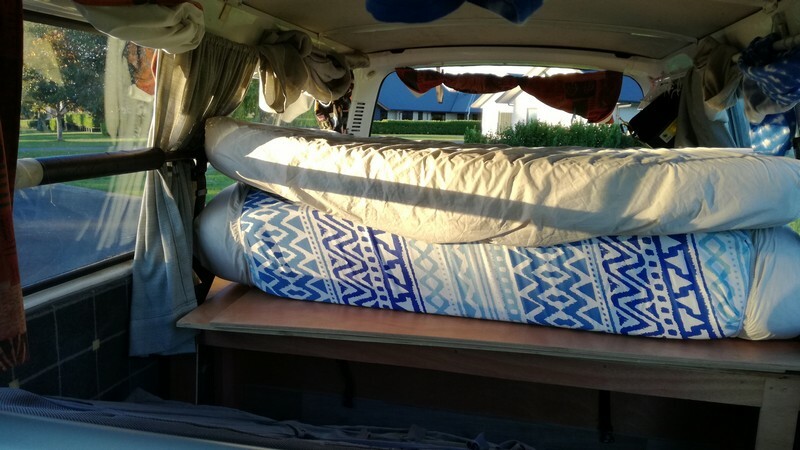 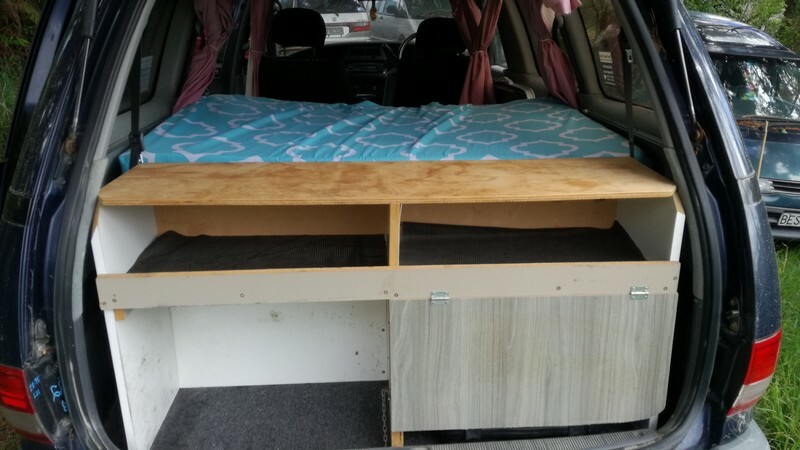 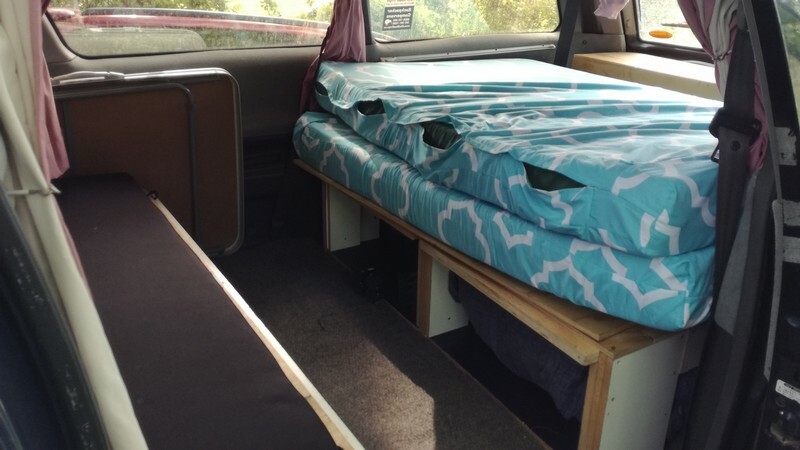 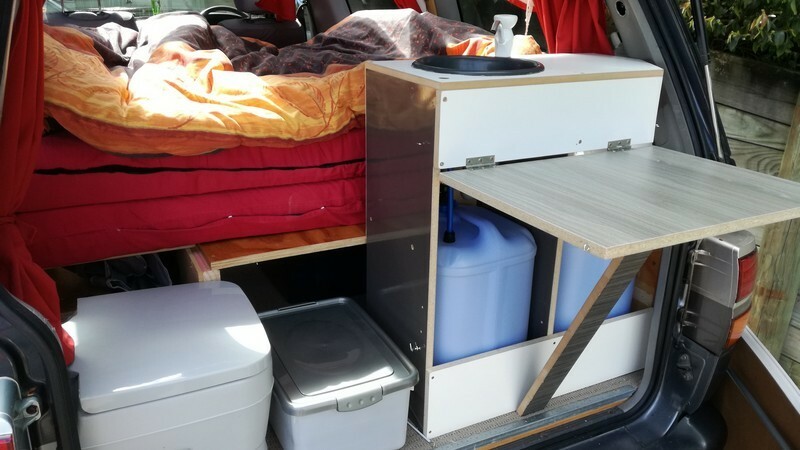 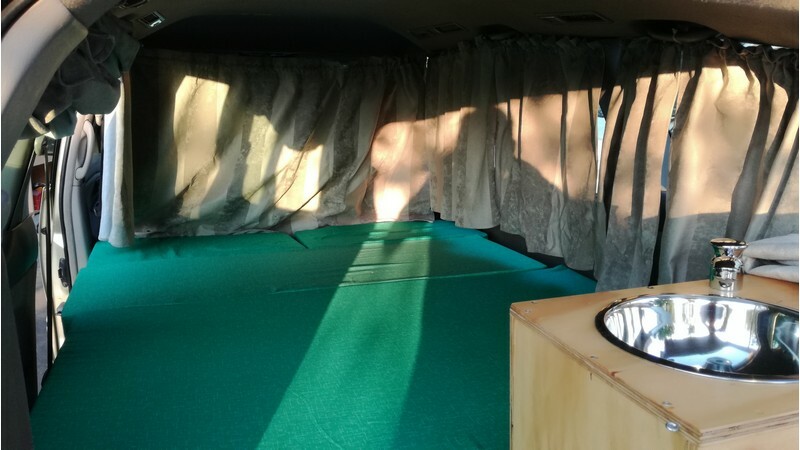 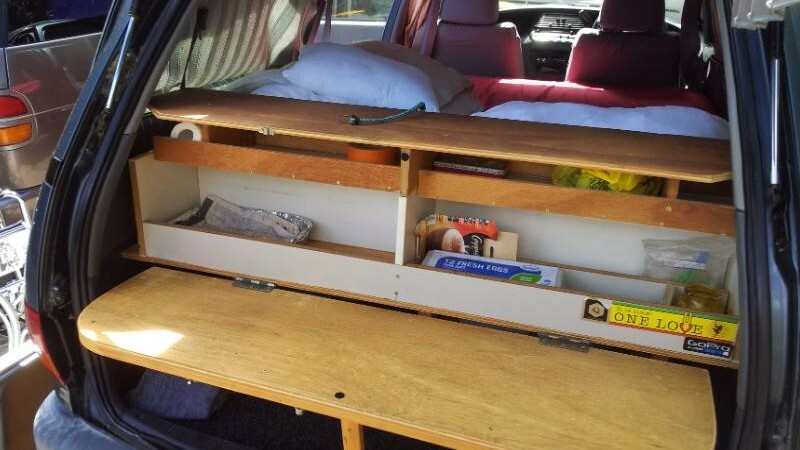 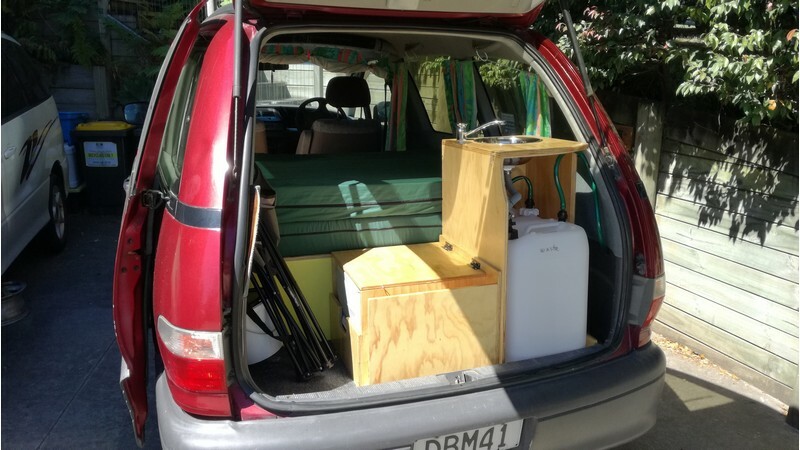 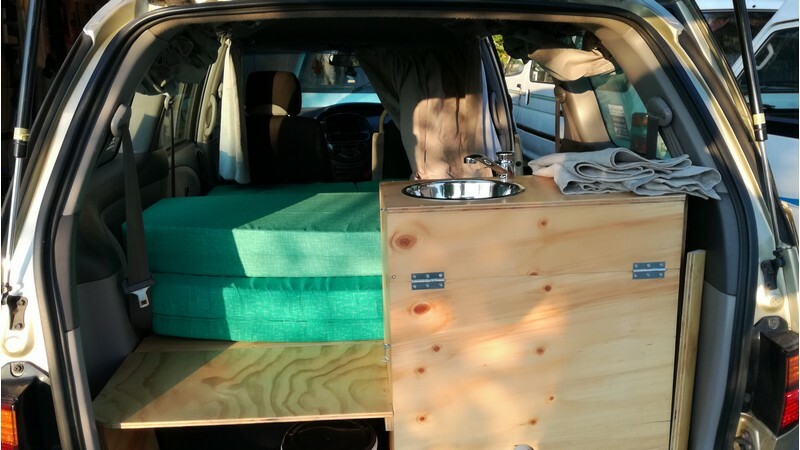 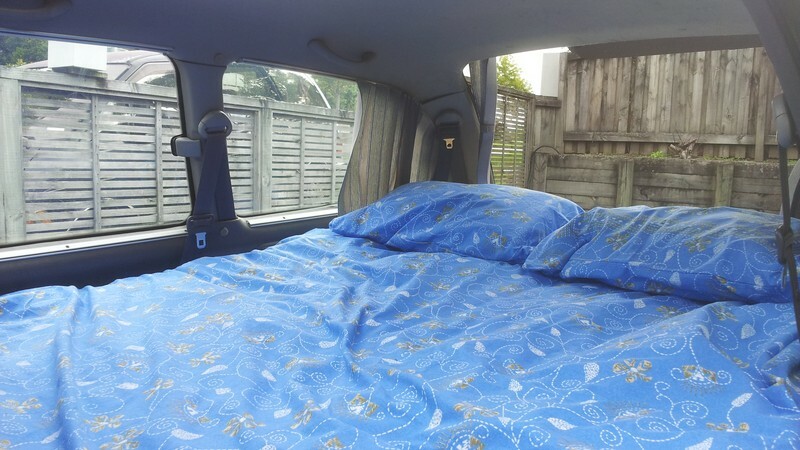 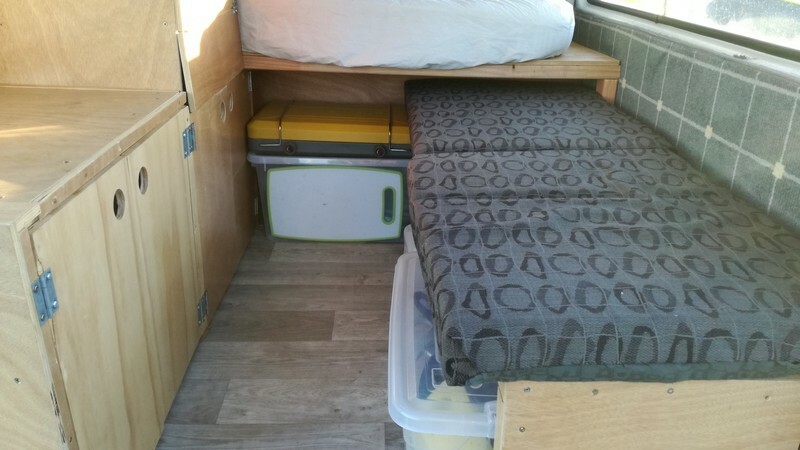 It has a double bed (1.9m x 1.35m wide), and come with a foam mattress, duvet and duvet cover, two pillows and pillow covers, new car seat covers, and some camping equipment including two chairs, table, plates, cutlery, cooker stove and storage bins. 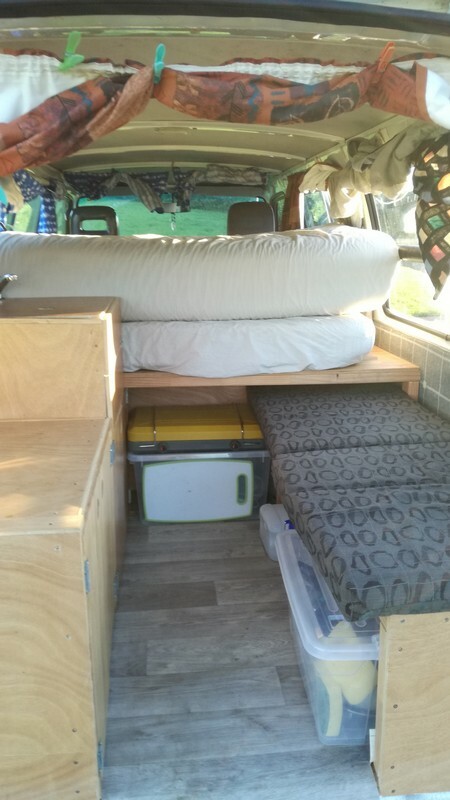 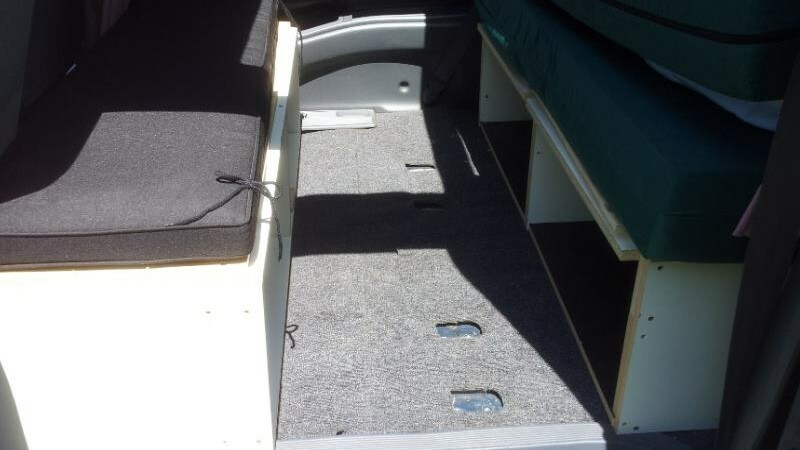 The bed folds away leaving inside seats and there is plenty of storage area. 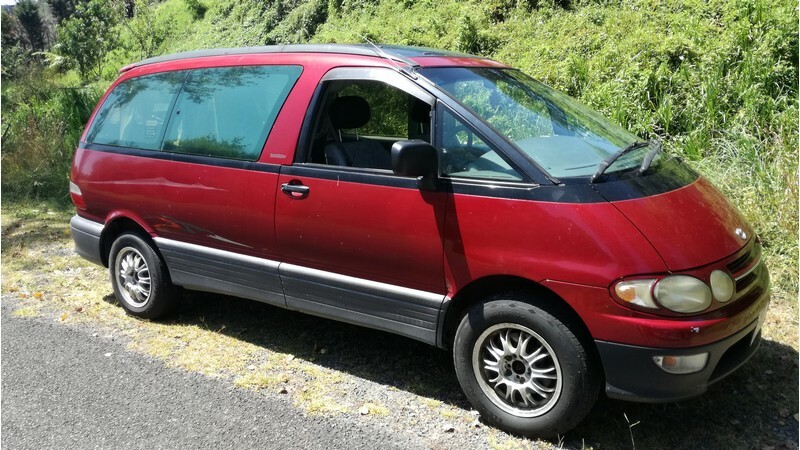 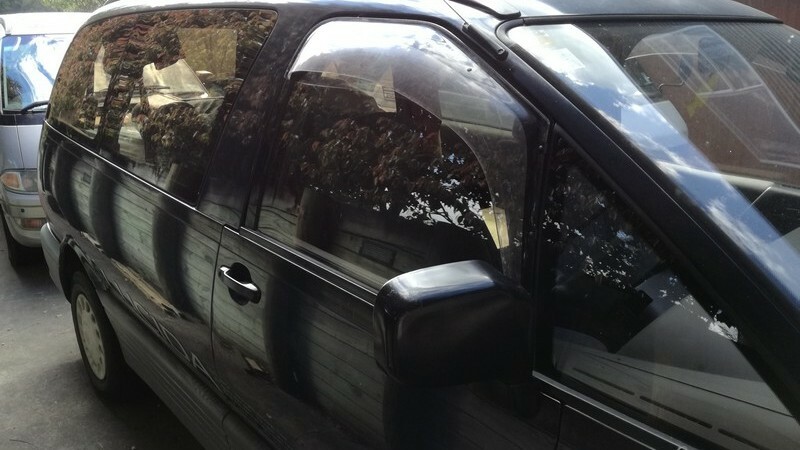 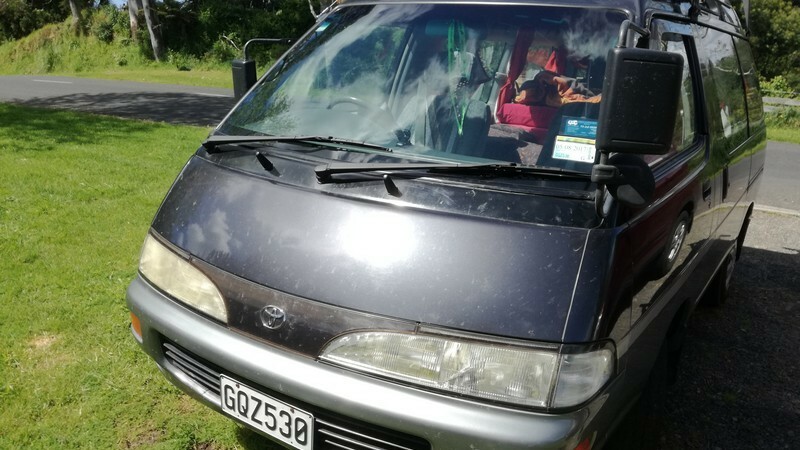 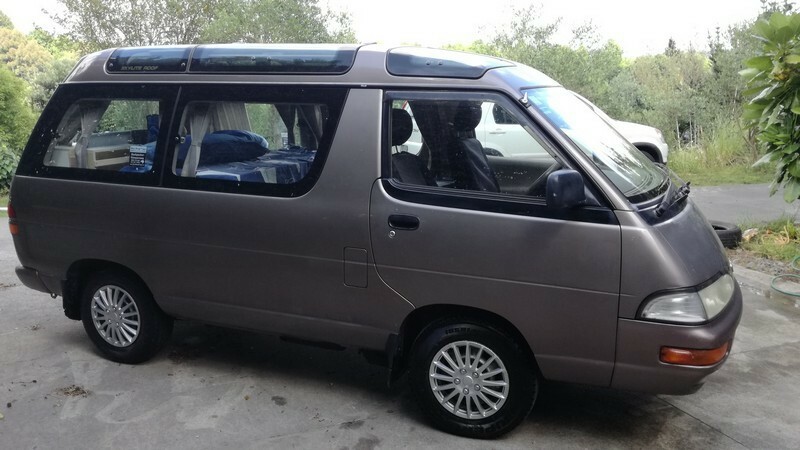 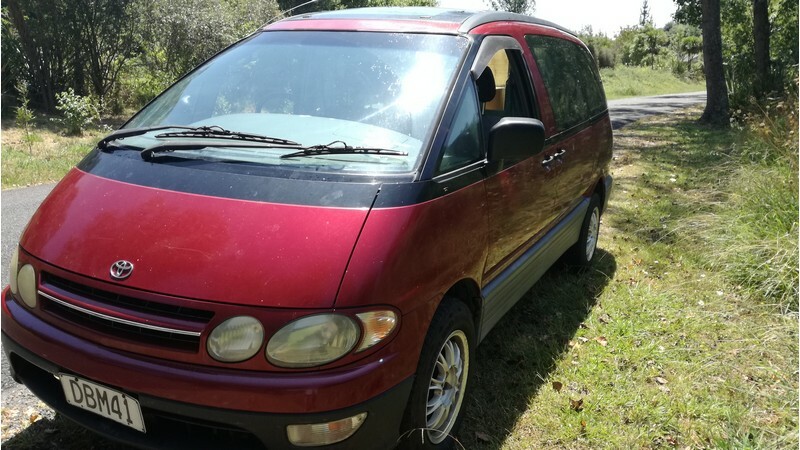 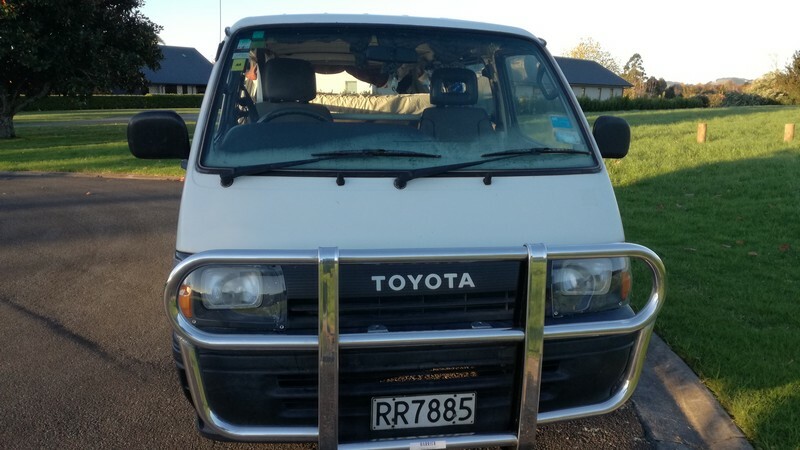 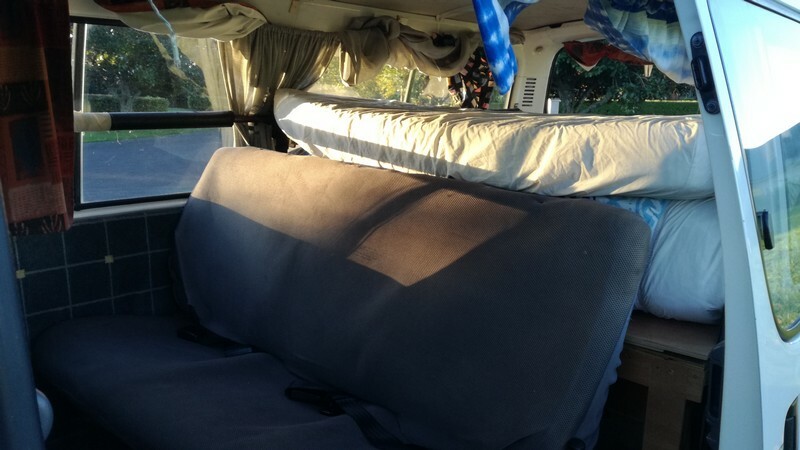 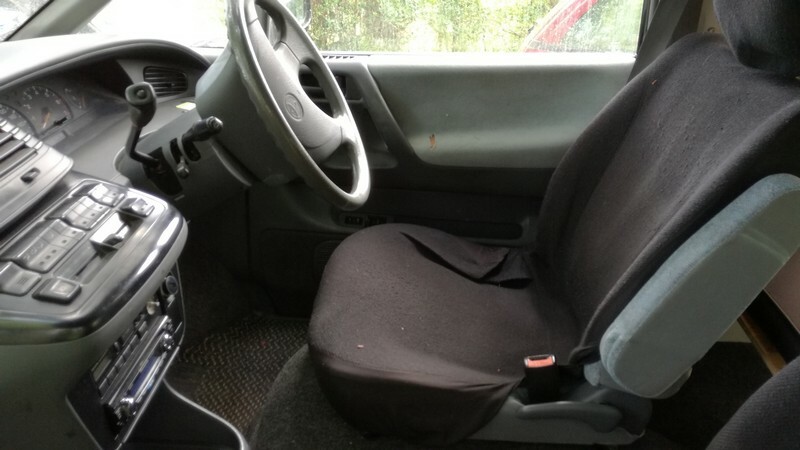 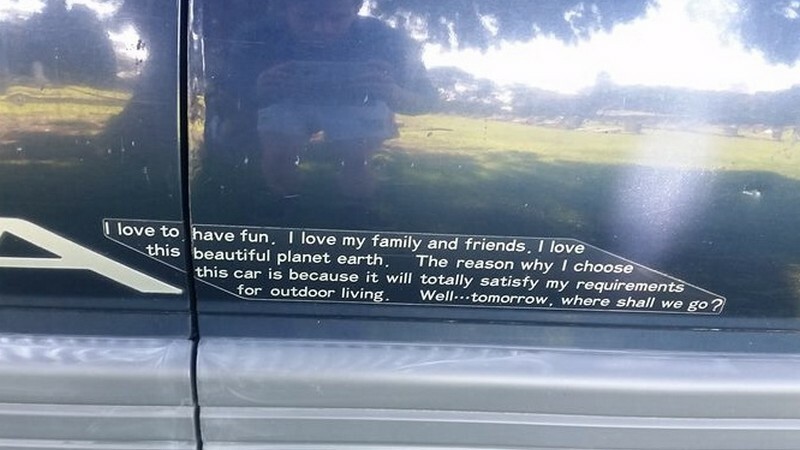 The van is good condition, tidy inside, has awesome sunroofs to let more light in which can be covered over at night, and body is in pretty good condition so also are the commercial tires. 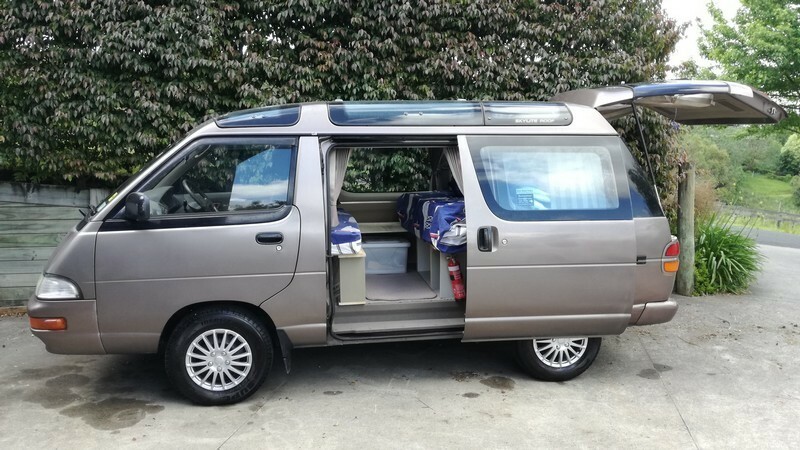 This is a Self-Containment Certified Toyota Liteace Campervan, Brown, 4 door van, Petrol, 1998cc, Manual, 244,500 km (approximate), 1992, with valid Reg Exp and valid WOF, Power steering, Sunroofs. 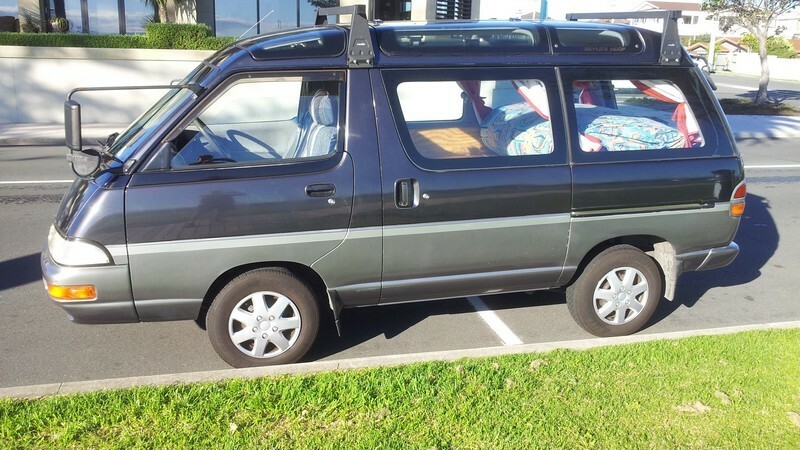 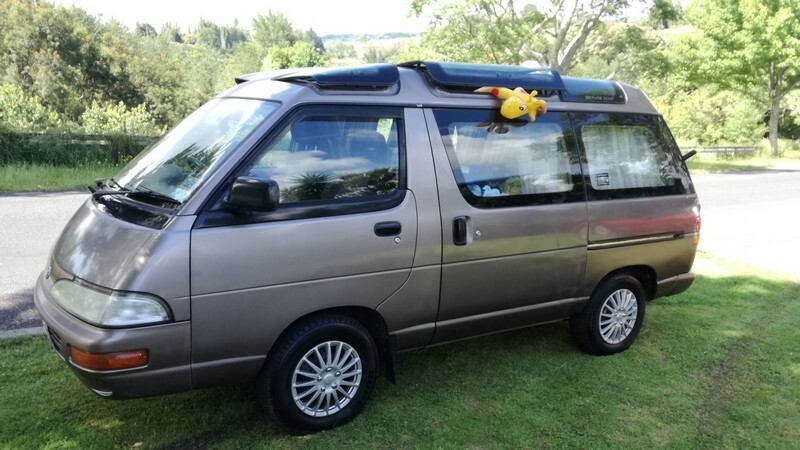 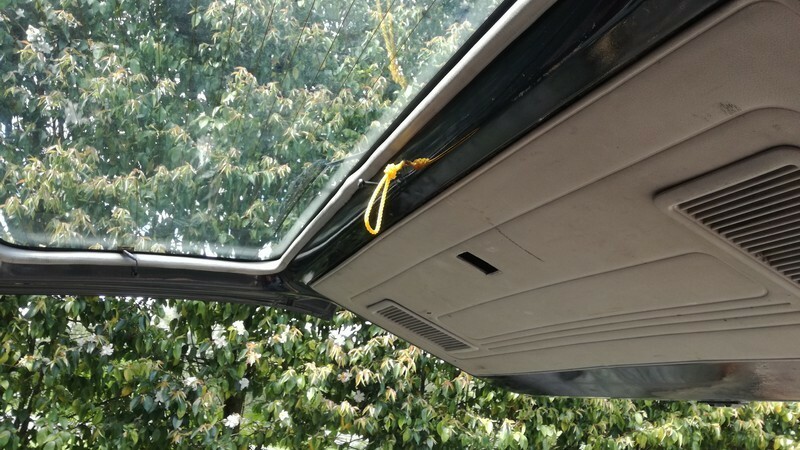 This Toyota Liteace makes an awesome campervan, ideal for backpackers with awesome looking sunroofs. 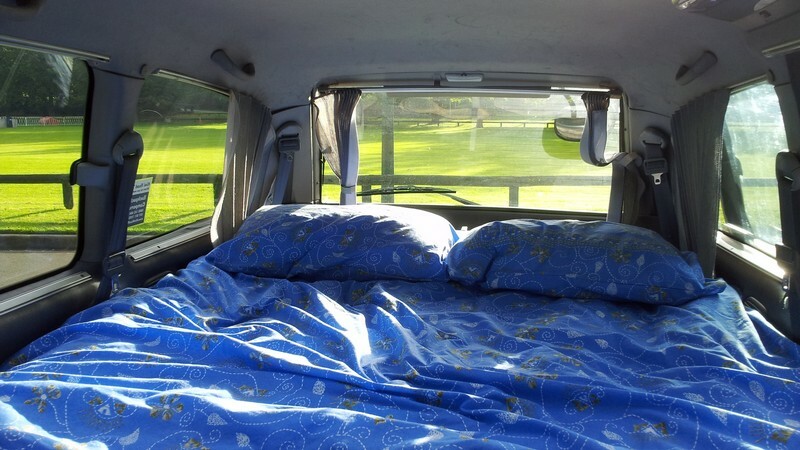 With this good condition campervan and good fuel economy you’ll be completely set to explore this incredible country. 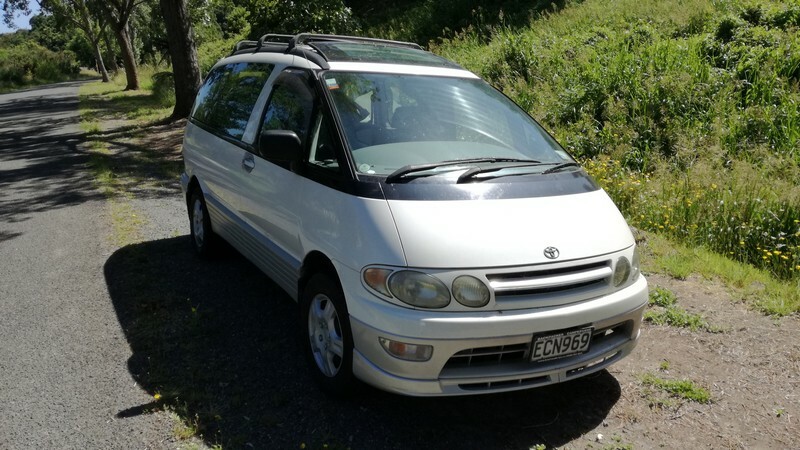 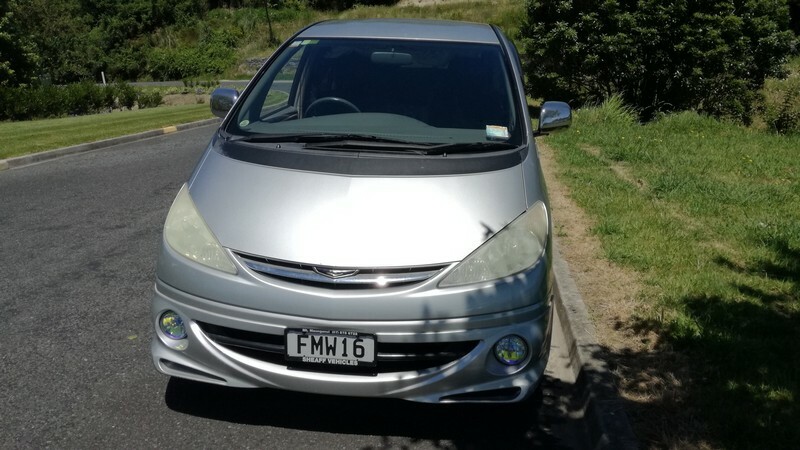 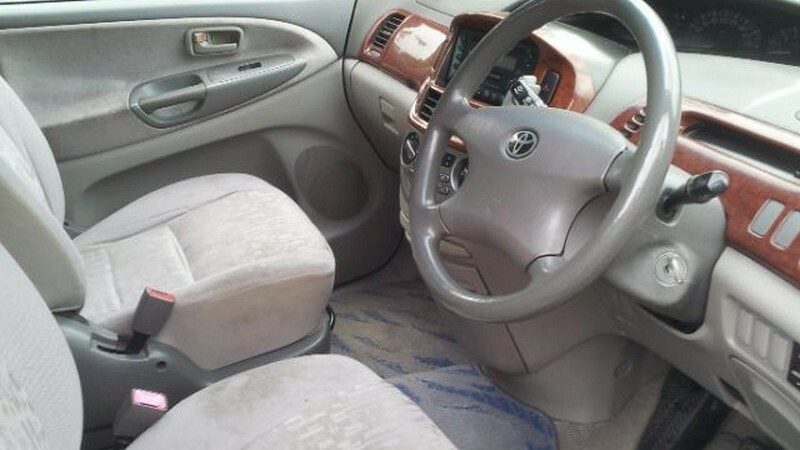 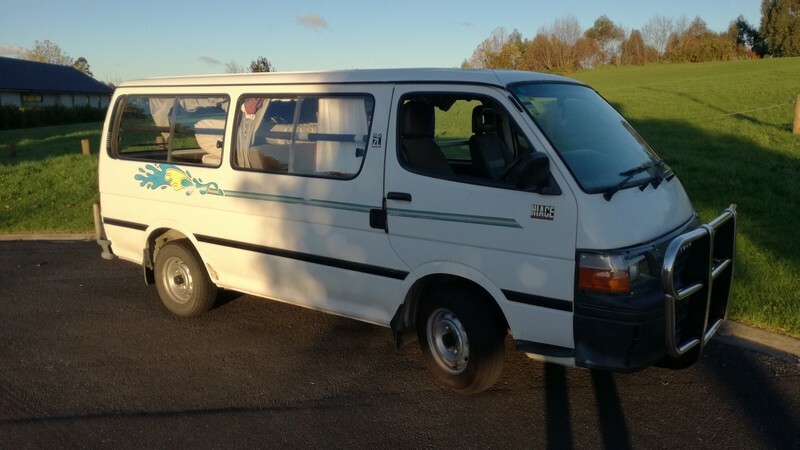 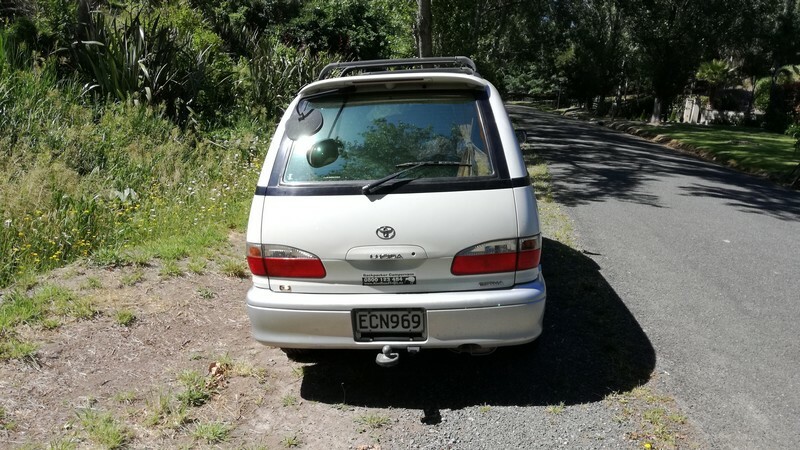 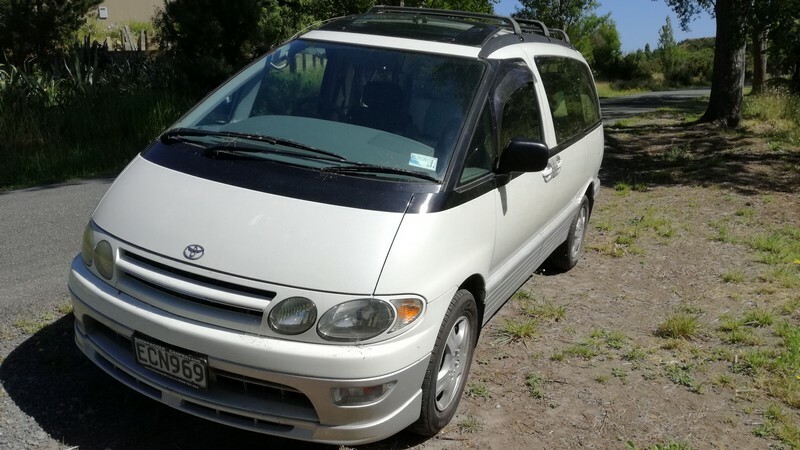 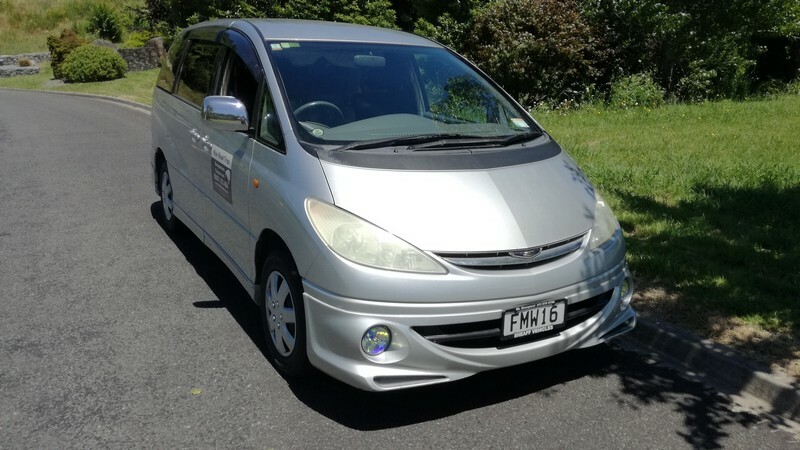 Toyota Estima Campervan,White, 1999, 4 door van, Petrol, 2430cc, auto, with valid Rego and valid WOF, Power steering, tinted windows and a nice roof rack. 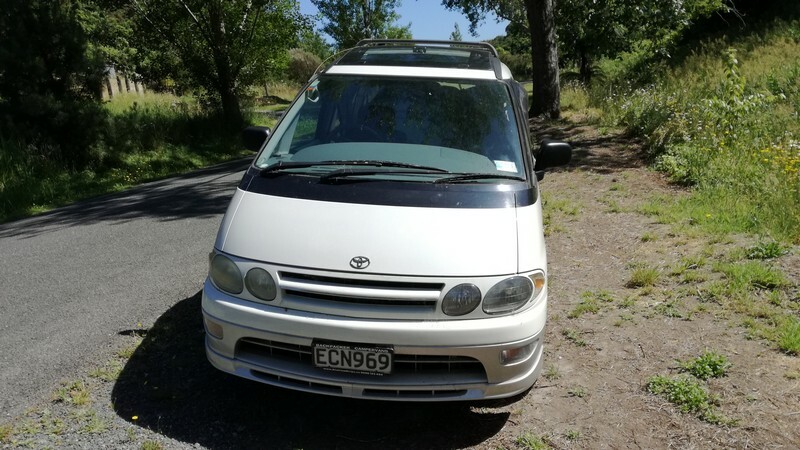 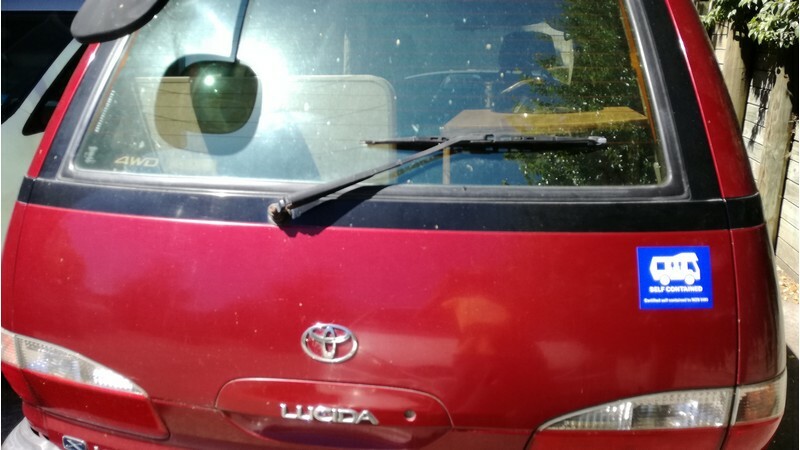 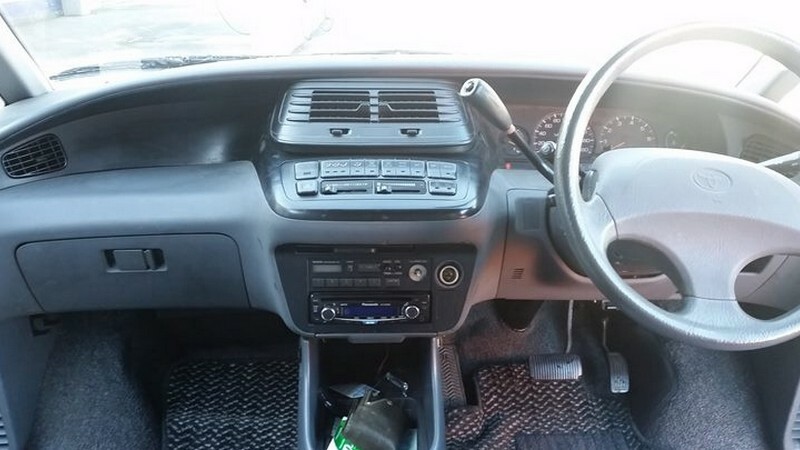 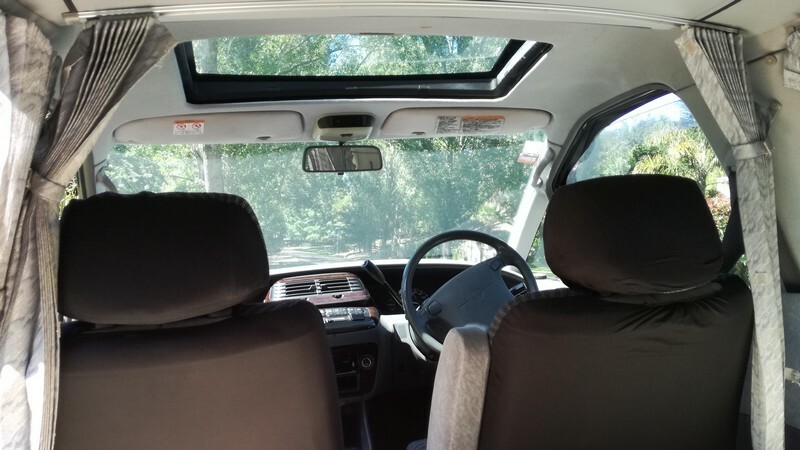 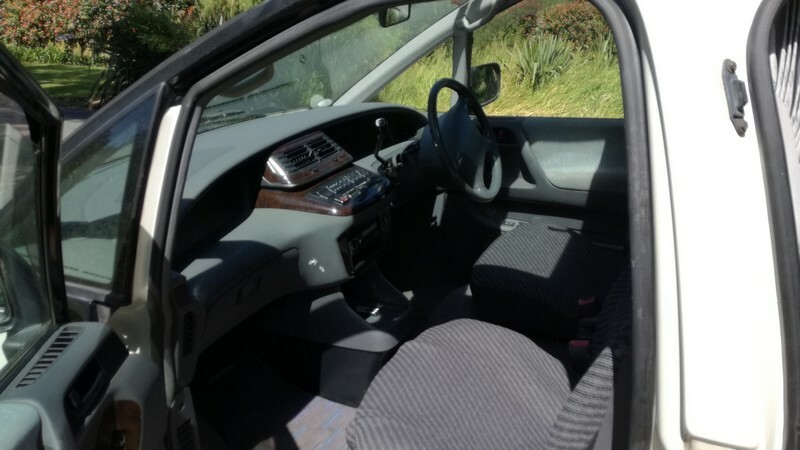 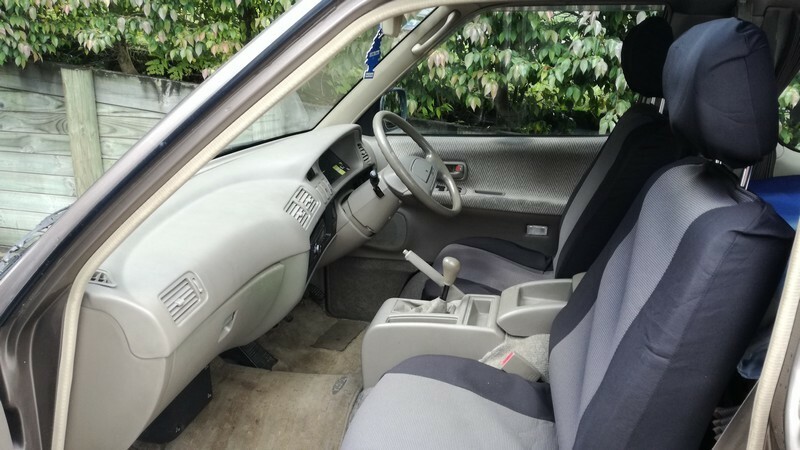 Toyota Estima Lucida Campervan, Grey, 4 door van, Petrol, 2438cc, Automatic, approximately 199,500 km, 1993, with valid Rego and valid WOF, Stereo, Air conditioning, Central locking , Power steering. 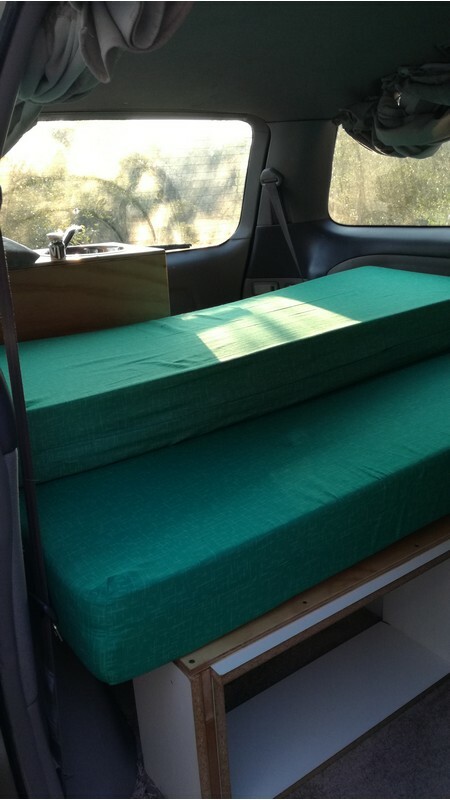 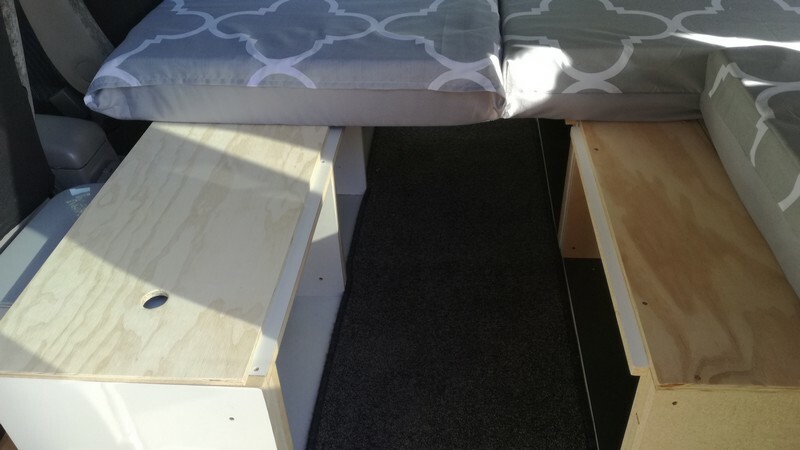 The double bed (1.9m x 1.35m wide) is super stable and can be folded back to allow seating inside the van. 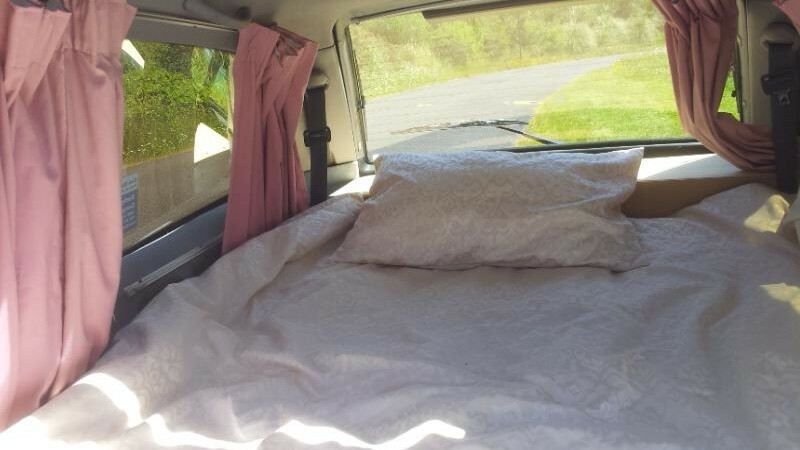 It comes with a foam mattress, duvet and duvet cover, two pillows and pillow covers. 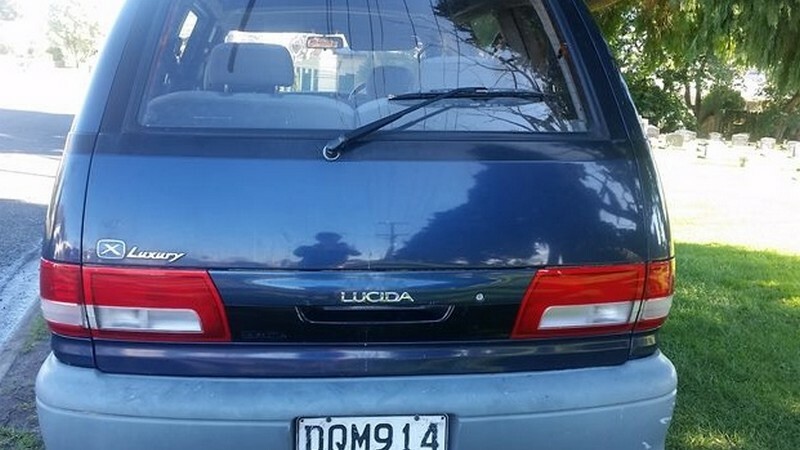 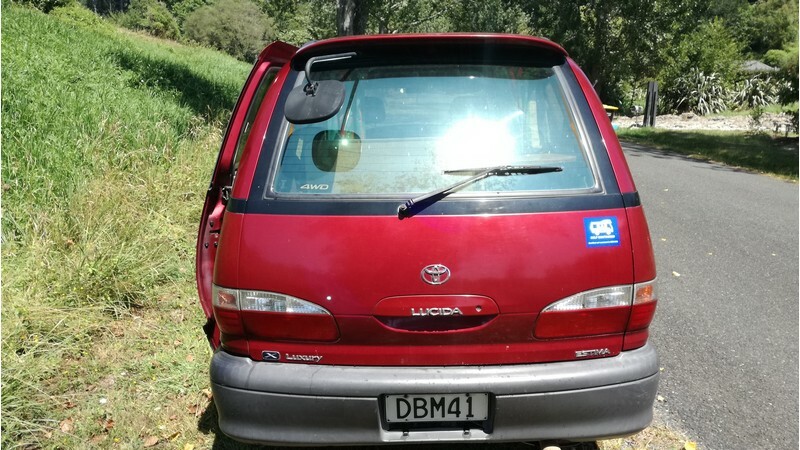 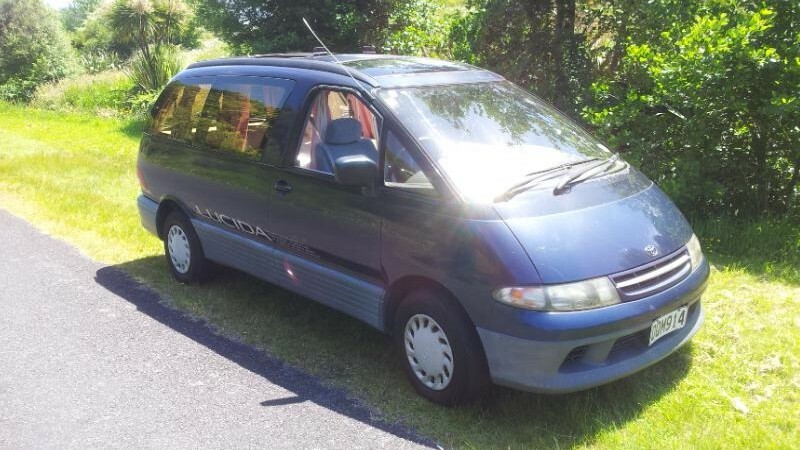 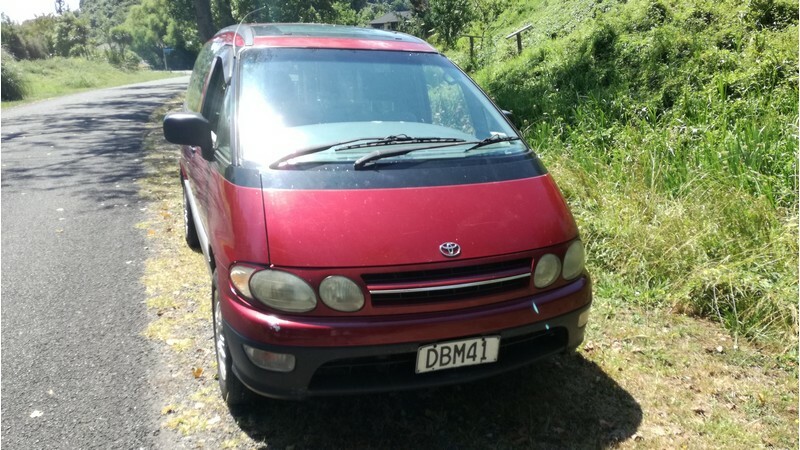 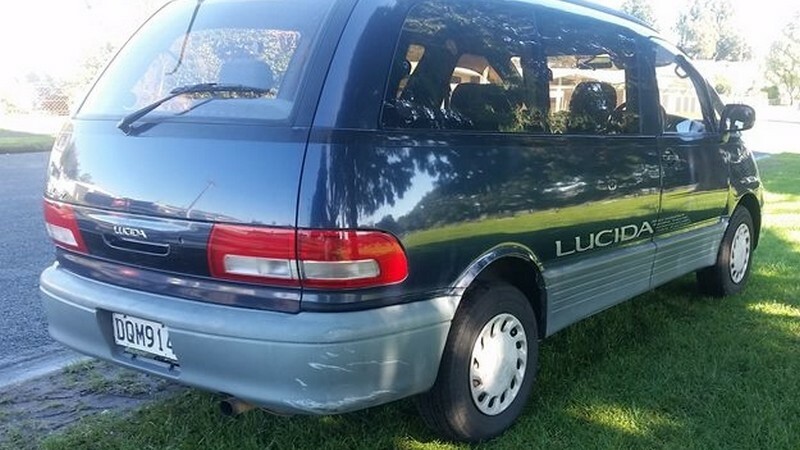 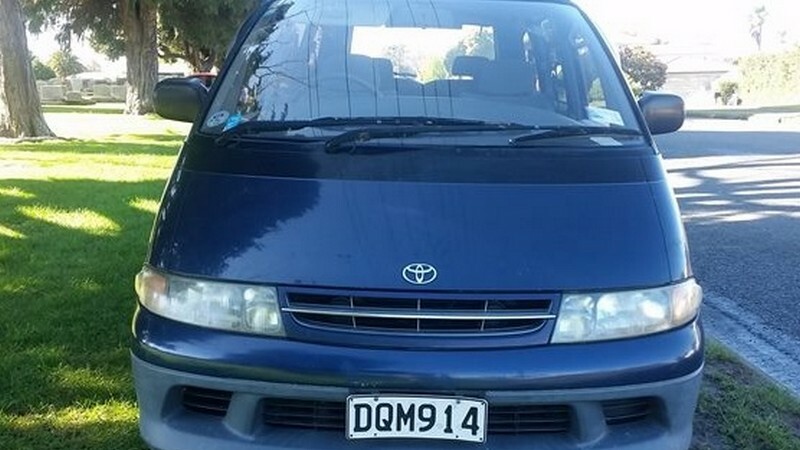 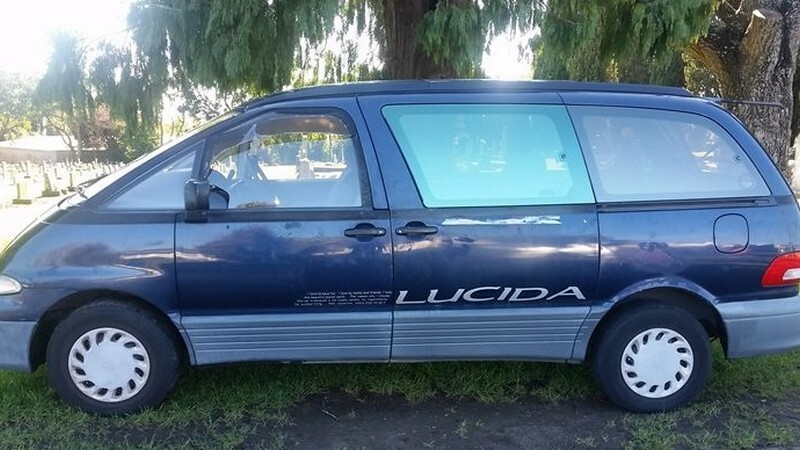 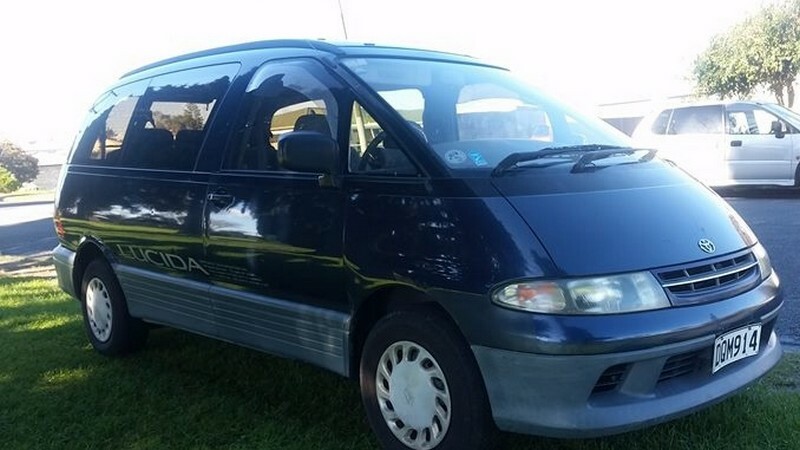 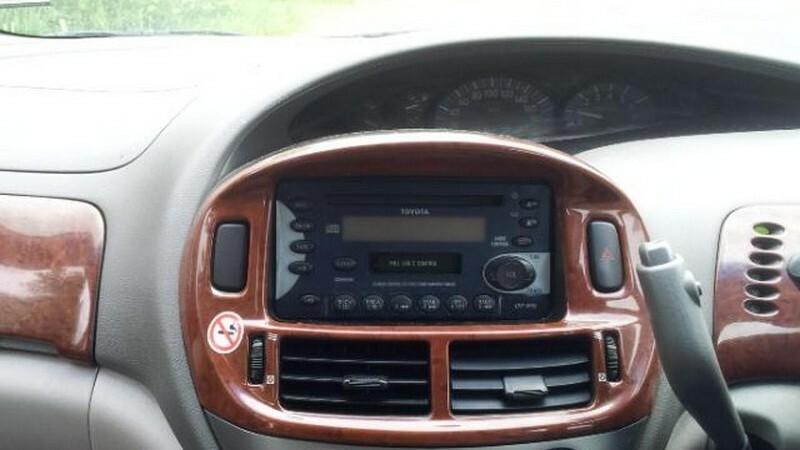 Toyota Estima Lucida Campervan, Dark Blue, 4 door van, Petrol, 2438cc, Automatic, 210,000 km, 1995, with valid Rego and valid WOF, stereo, fan, power steering. 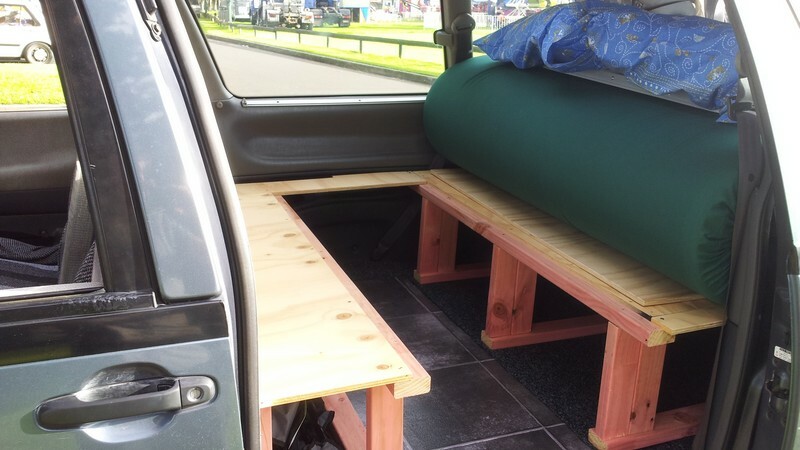 Fitted with a double bed (1.9m x 1.35m wide) which can be folded back to allow seating inside the van. 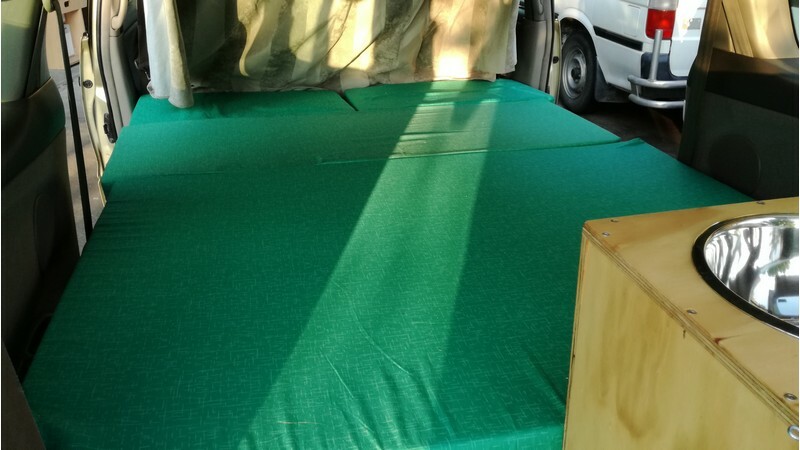 It comes with a foam mattress, duvet and duvet cover, two pillows and pillow covers. 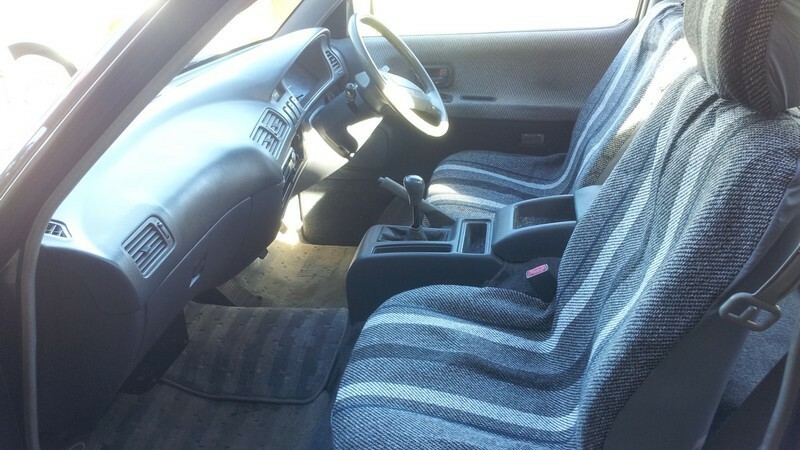 Toyota Hiace ZL 1992, White, 2.4l, Petrol, Manual, approximately 271,500 km, rego RR7885. 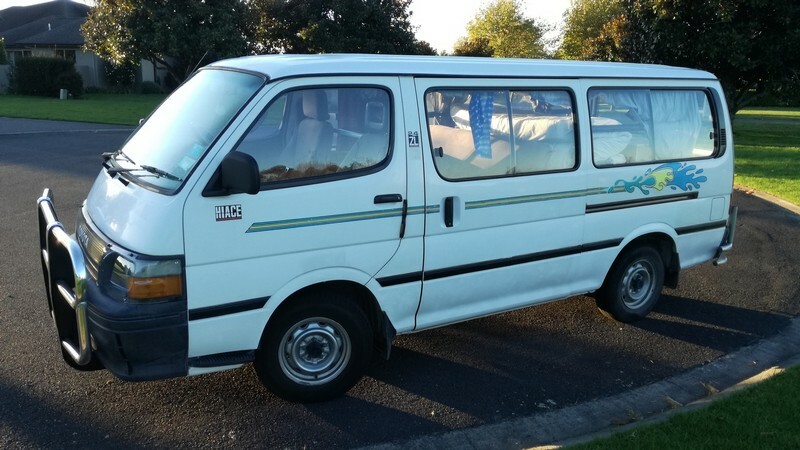 Plenty of room in this older-style Toyota Hiace. 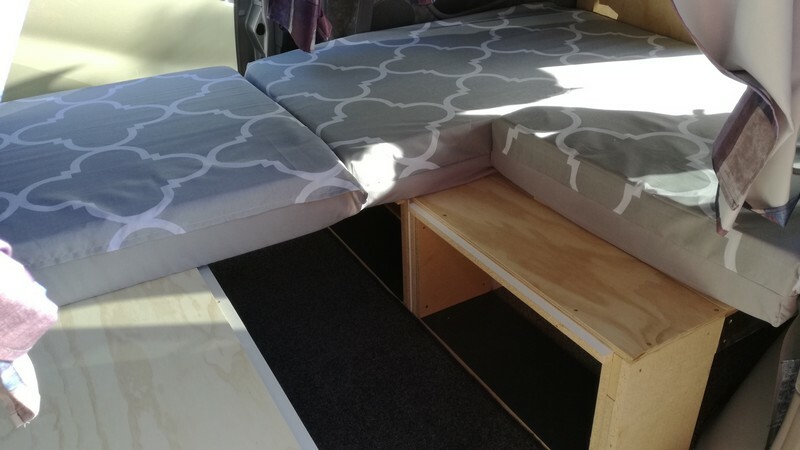 Self-contained for 4-people but realistically 2 adults and 2 young children with some imagination for sleeping arrangements; or two inside on the double bed and two using a tent that we can also provide. 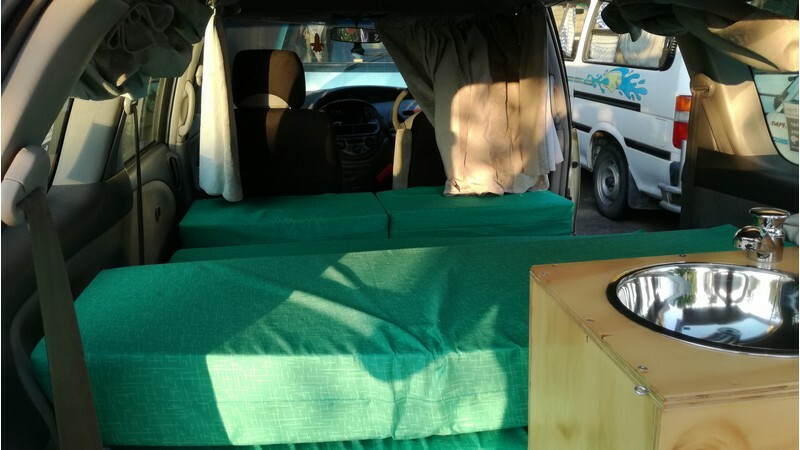 It’s a 5-seater with seat belts but just 2 adults sleeping inside. 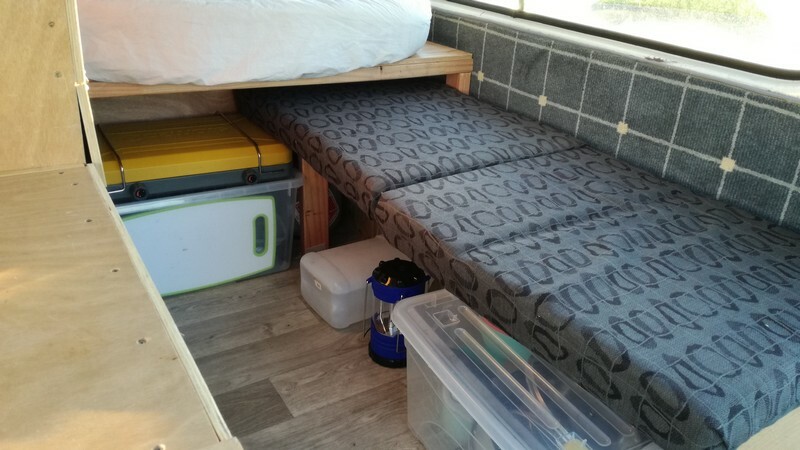 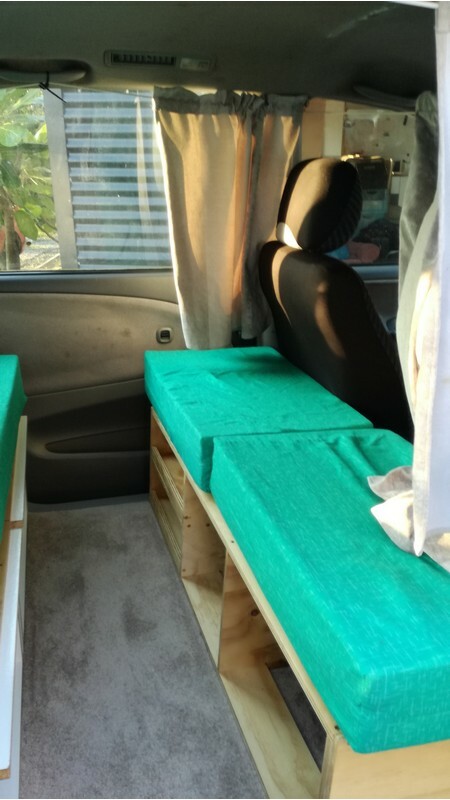 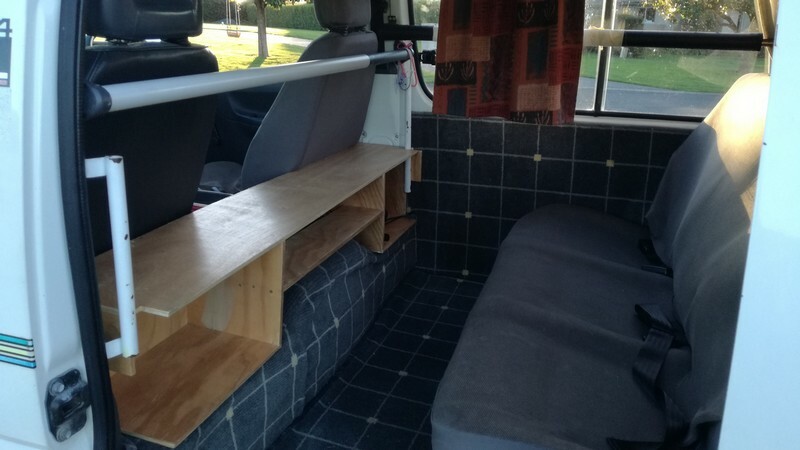 It has a comfortable double bed (1.9m x 1.35m wide) which is folded back to allow seating inside the van in the back on a bench seat with 3-seat belts in additional to the driver and passenger seats. 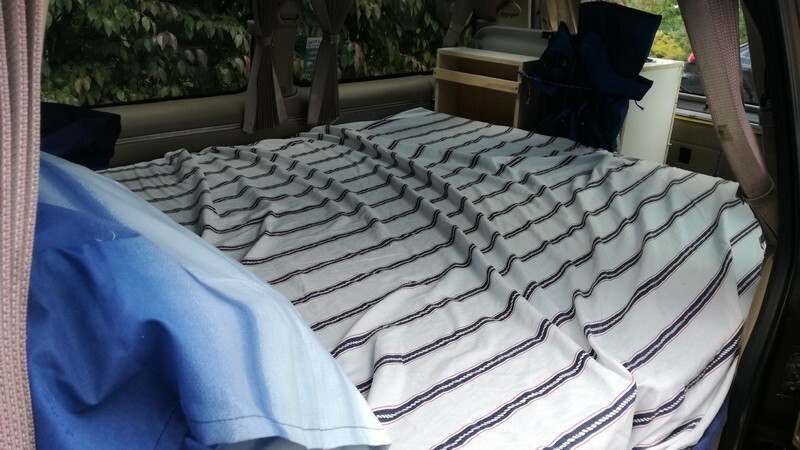 It comes with a good mattress, duvet and duvet cover, pillows and pillow covers. 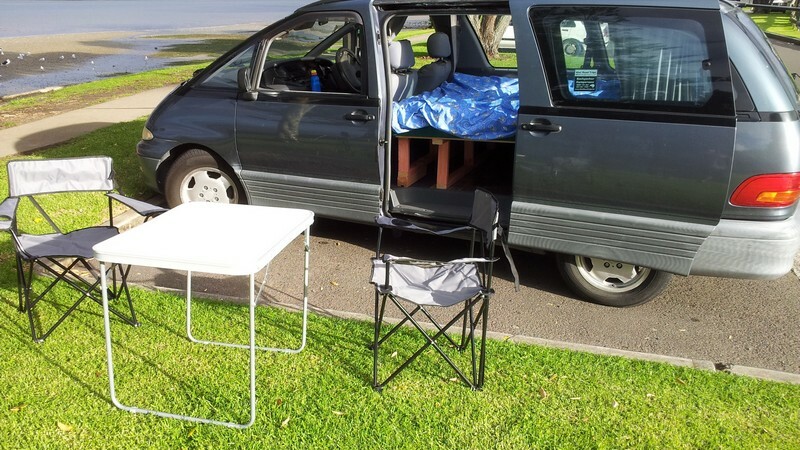 Camping equipment included such as chairs, table, plates, cutlery, cooker stove, tea towels and large storage bins. 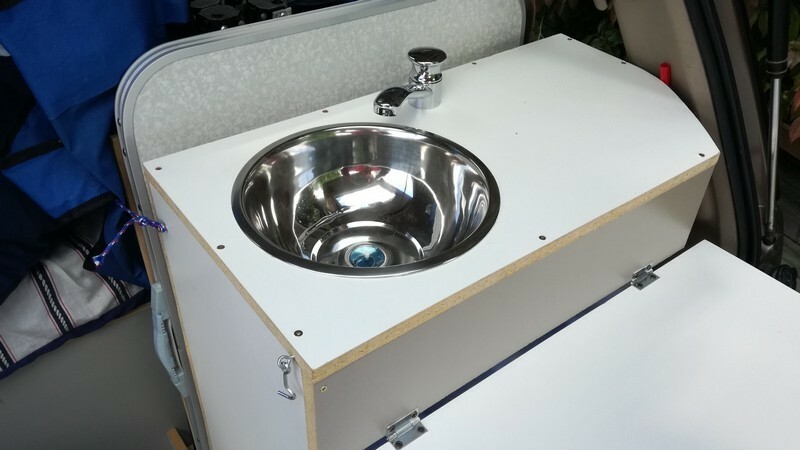 Being self-contained certified it has a sink in the kitchen area, fresh water and waste water containers, and a portaloo.